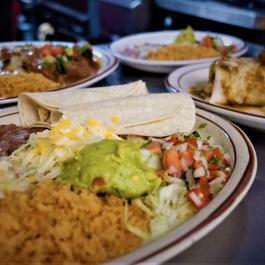 Here at Ernie’s Mexican Restaurant in North Hollywood, our kitchen creates the most delicious and authentic Mexican cuisine. 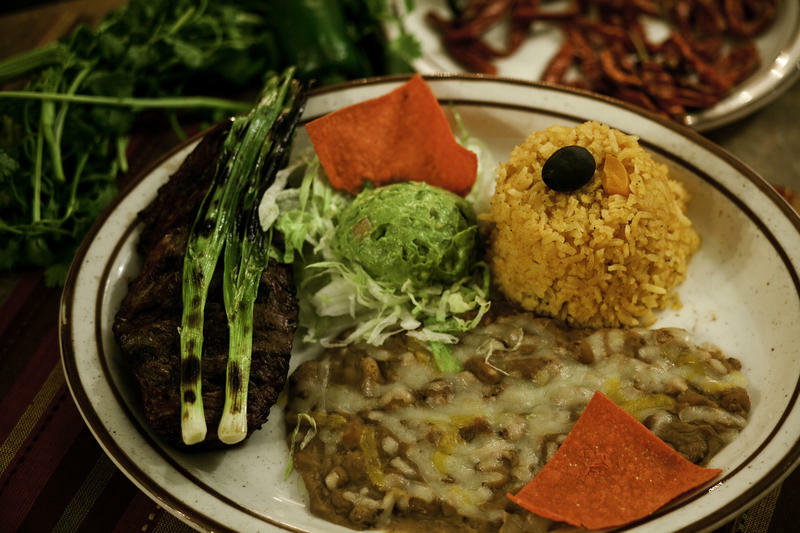 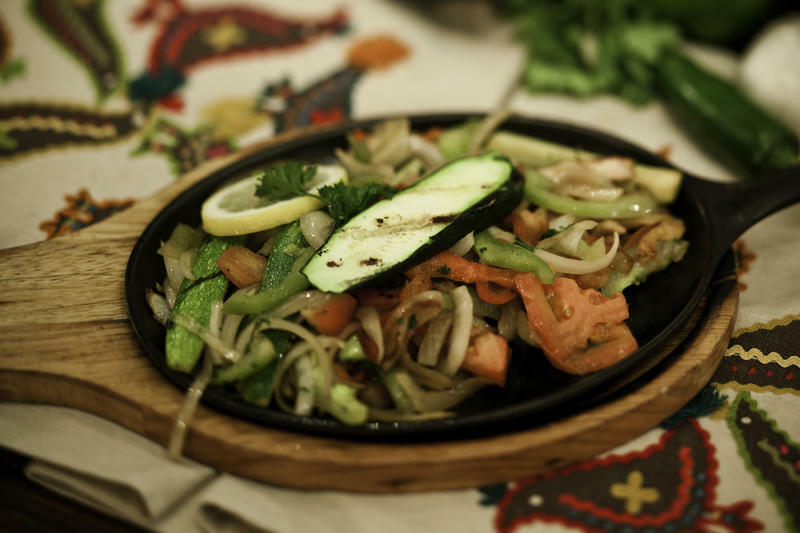 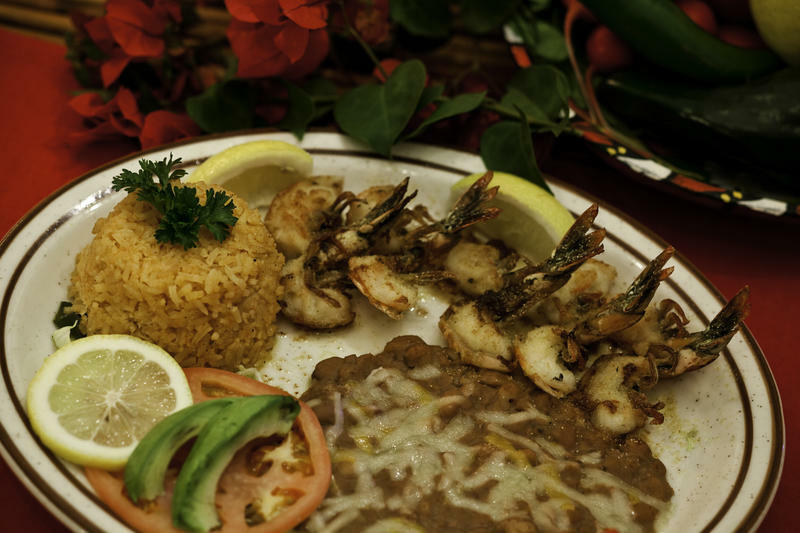 For over 65 years, we have become the go-to spot for mouthwatering Mexican cuisine in the San Fernando Valley and Burbank area. 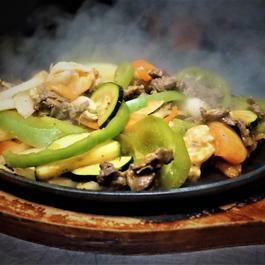 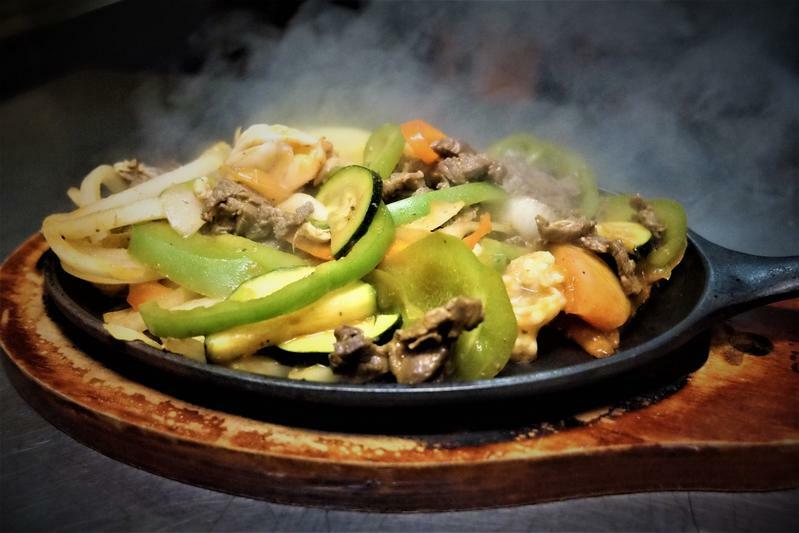 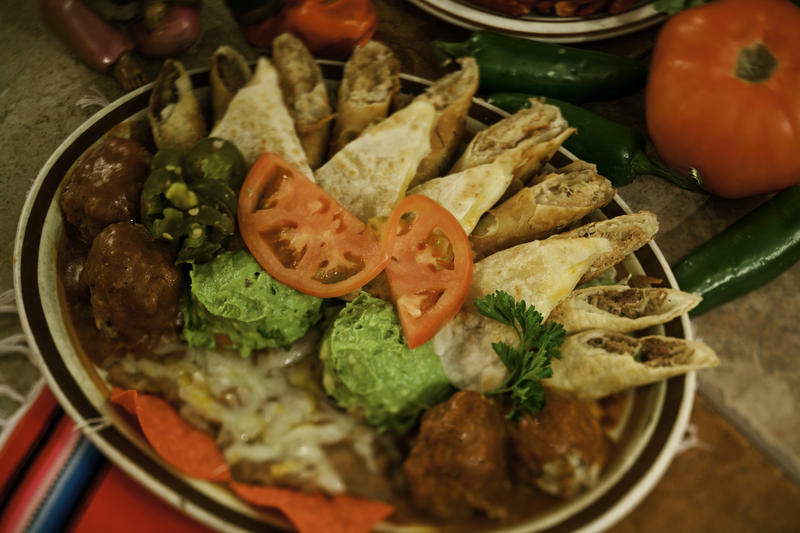 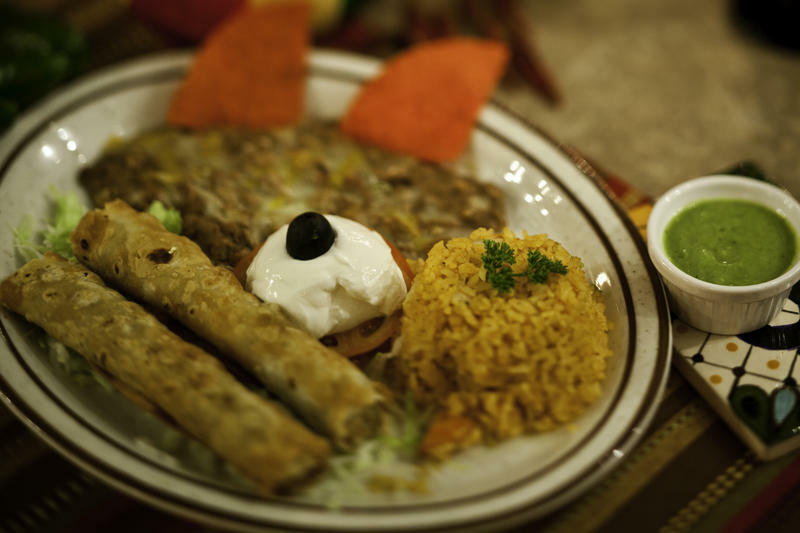 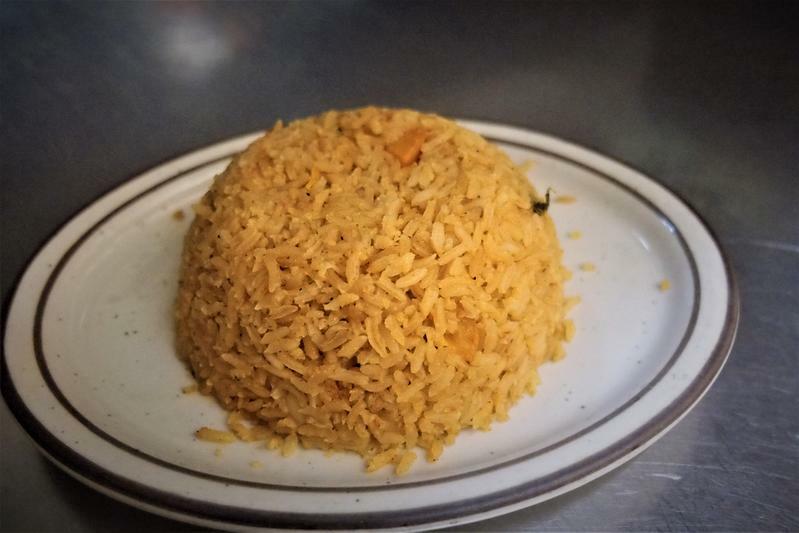 Our extensive menu offers a diverse assortment of delectable Mexican dishes, such as wet burritos, a variation of tacos, fajitas, tamales, tampiqueñas, and much more. 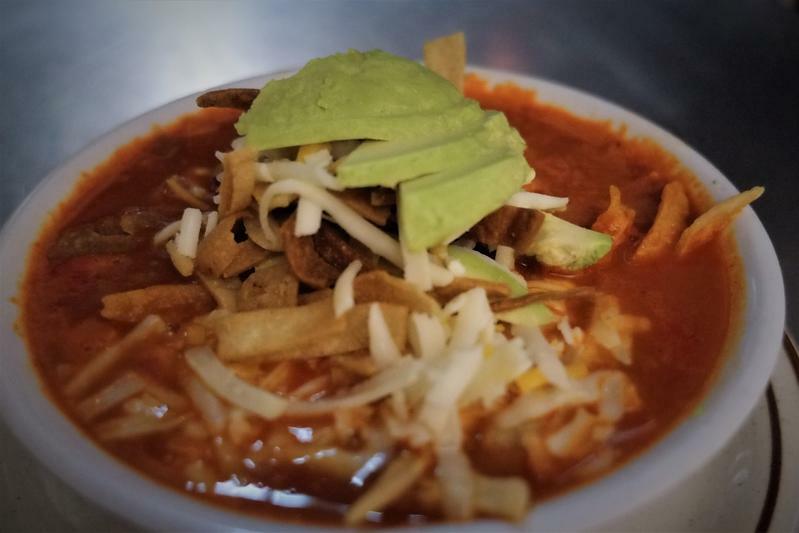 If you’re craving traditional Mexican food, our talented chefs can cook just about anything, including pozole, chilaquiles, albondigas soup, tacos de papa, and even chiles rellenos. 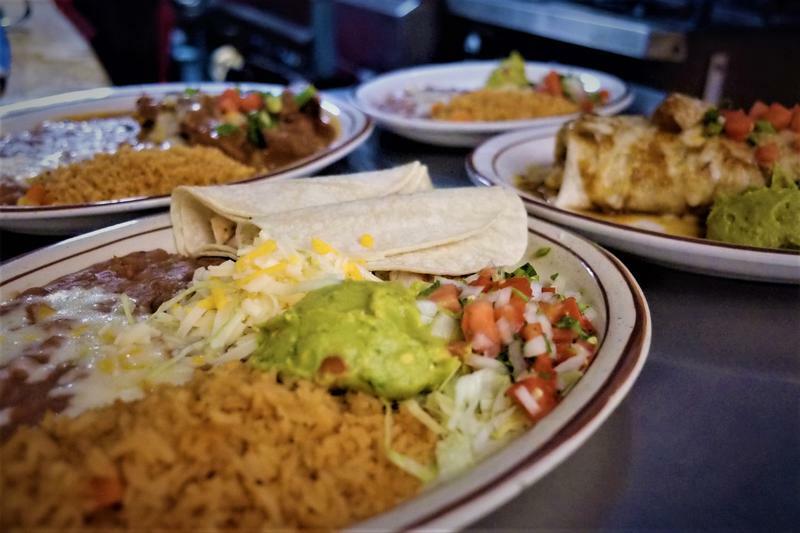 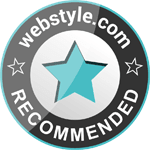 From our excellent customer service, exceptional Mexican food and friendly setting, Ernie’s Mexican Restaurant will exceed all of your expectations. 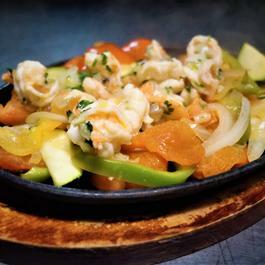 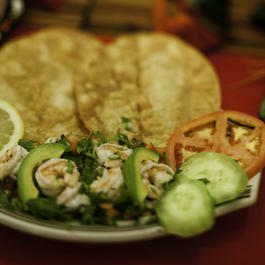 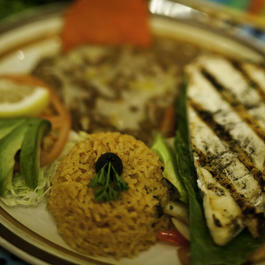 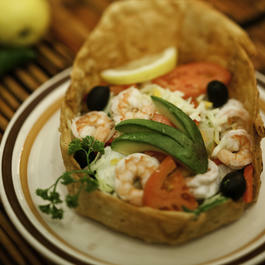 With Ernie’s Mexican Restaurant, each Mexican dish is prepared with the highest quality ingredients and care. 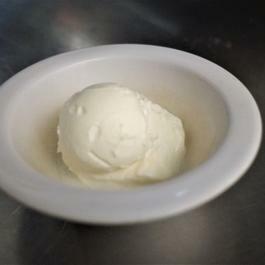 There is absolutely no lard in any of our dishes. 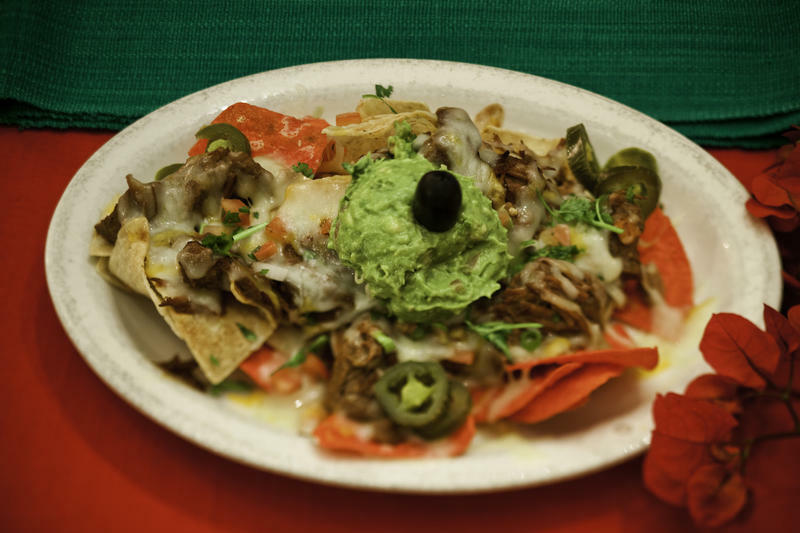 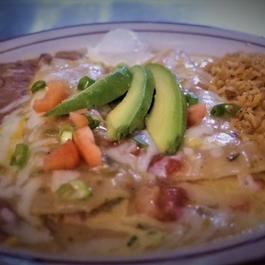 From homemade tortilla chips, well-seasoned meats, a burrito smothered in melted jack cheese and mild red sauce, to our delicious margaritas, you can always enjoy an authentic Mexican dish at Ernie’s Mexican Restaurant. 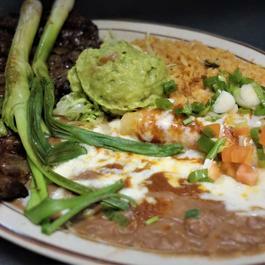 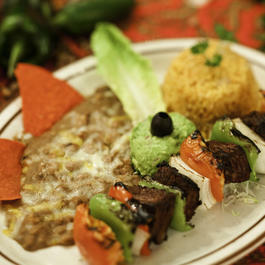 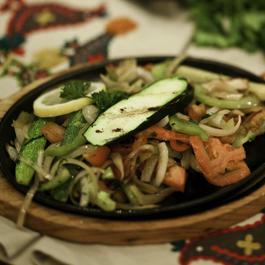 We only use the freshest components to create the best Mexican meal for our customers’ enjoyment. 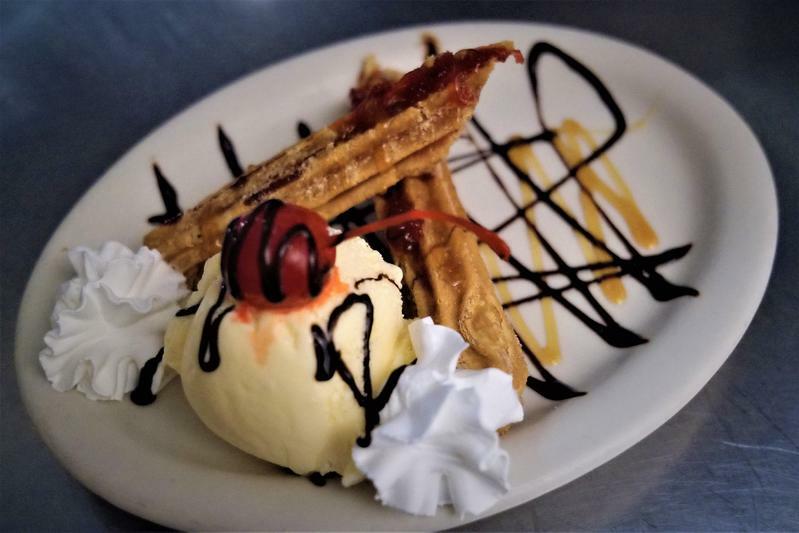 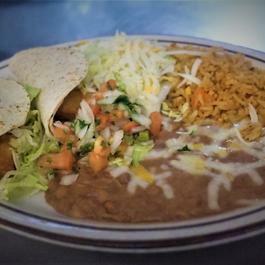 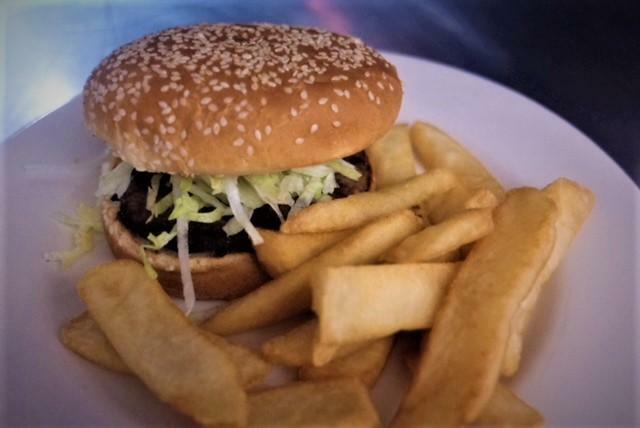 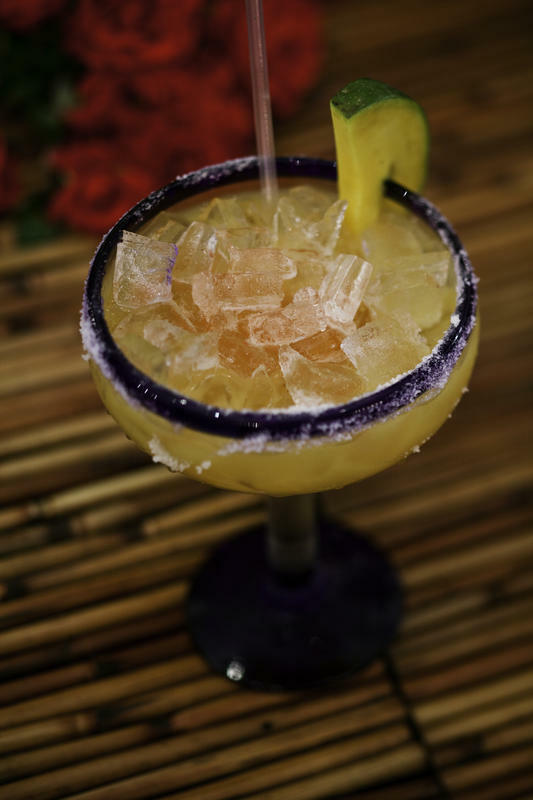 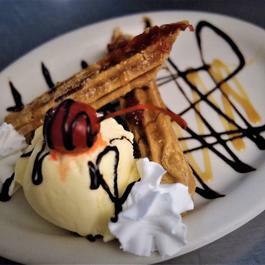 Visit Ernie’s Mexican Restaurant during lunch hours or after work, our affordable lunch menu and excellent happy hour menu will keep both your wallet and taste buds happy and satisfied. 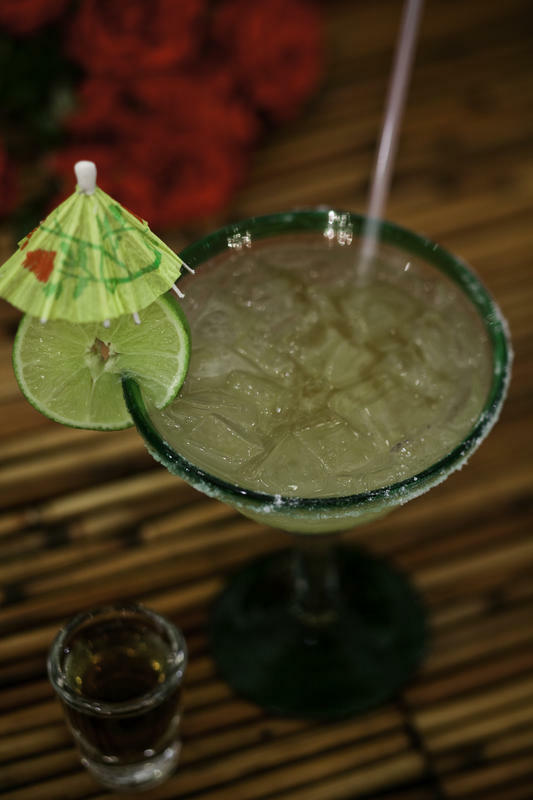 Along with a fully stocked bar, live music entertainment is available on Friday and Saturday evenings. 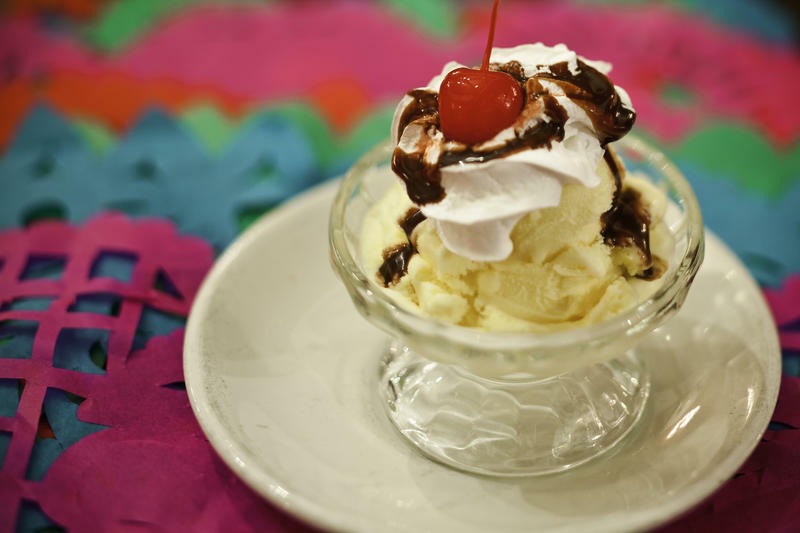 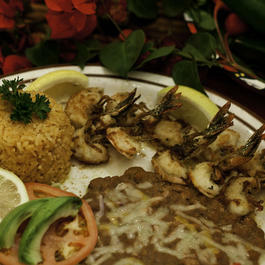 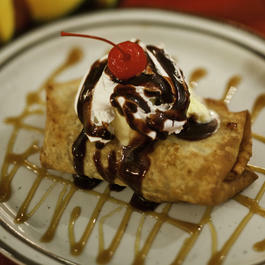 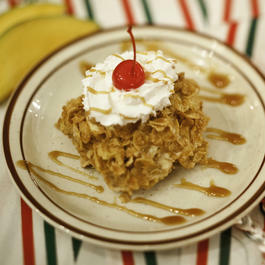 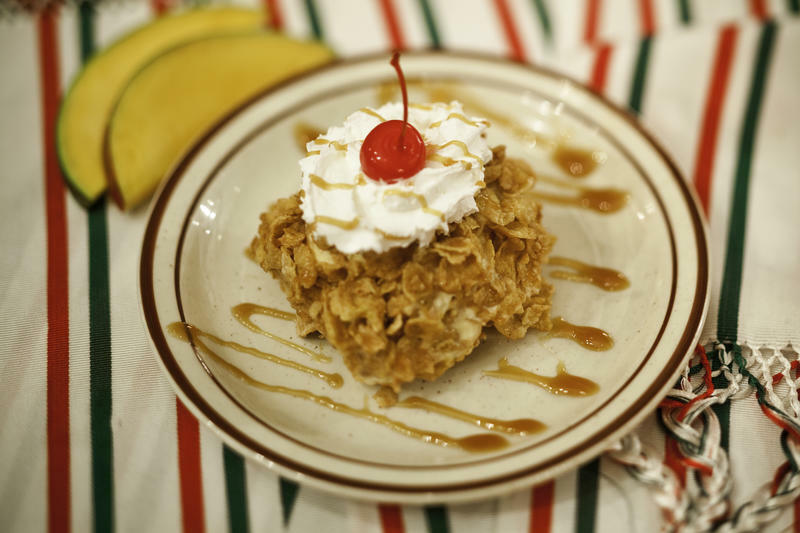 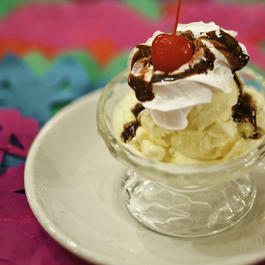 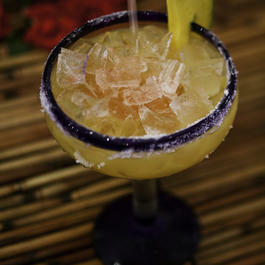 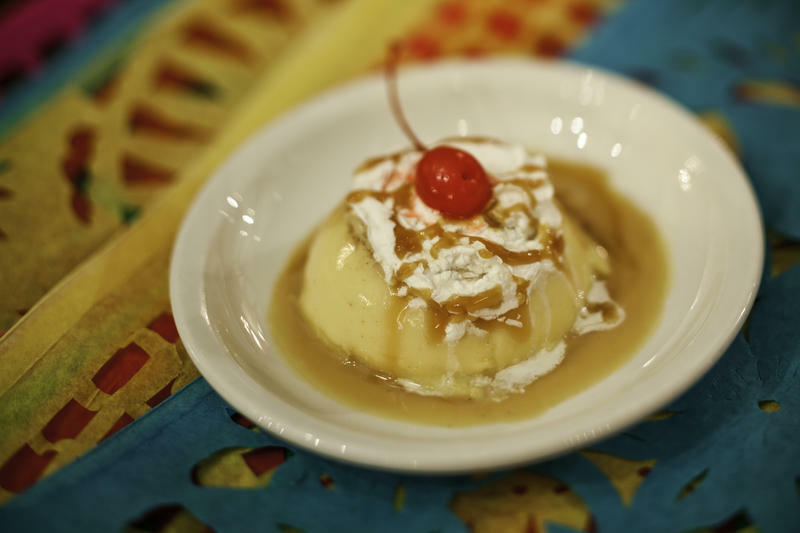 Dine with Ernie’s Mexican Restaurant and experience the taste of heaven. 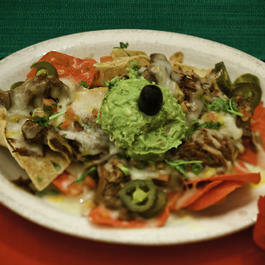 Corn chips, topped with melted cheese and refried beans, covered with your choice of chile con carne (pork, shredded beef, or chicken) and heated with bits of green onions, tomato, and guacamole. 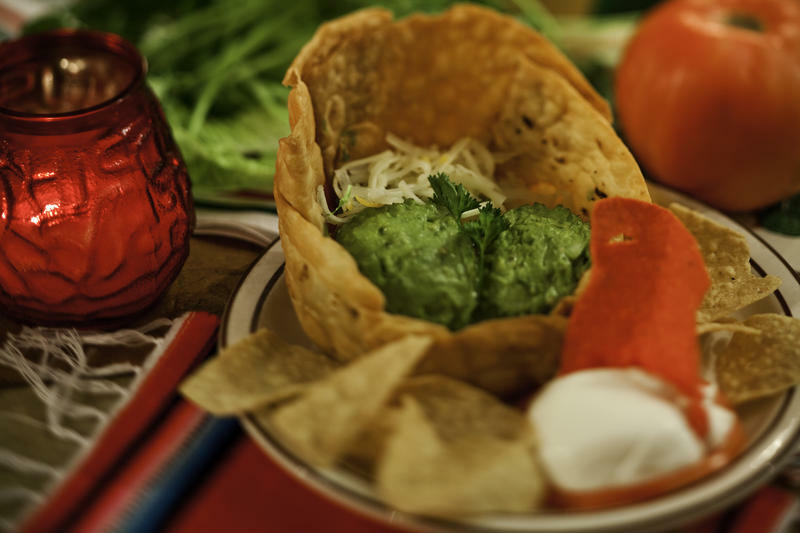 CONCHA Delicious avocado dip served in a crispy shell, garnished with shredded lettuce, bits of green onions, diced tomato, sprinkled with Monterey Jack cheese, and topped with a scoop of sour cream. 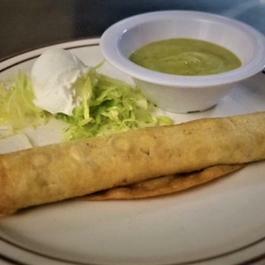 (1) Chicken flauta, (1) beef flauta, (2) beef taquitos, (1) mini quesadilla, (4) albondigas, all served with a scoop of guacamole and a portion of refried beans. 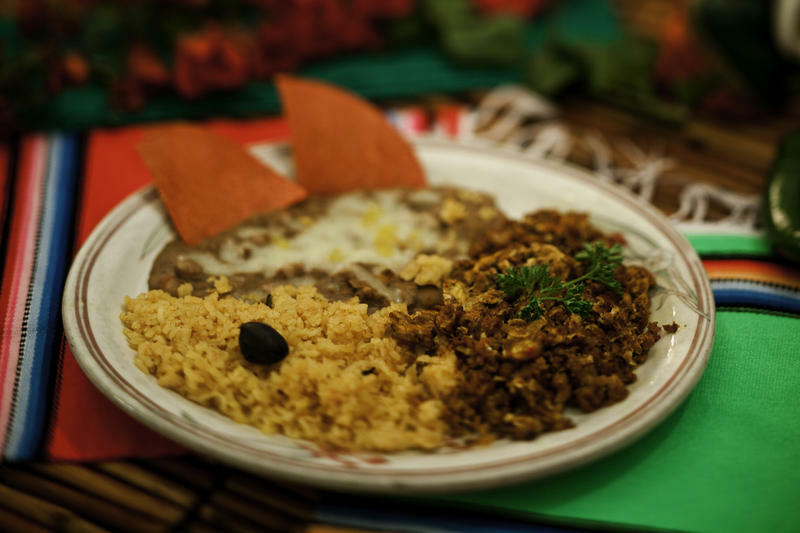 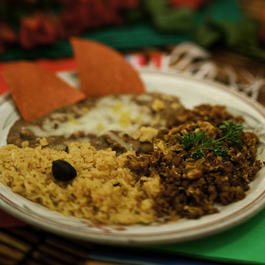 Mild Mexican sausage combined with scrambled egg, served with refried beans, Mexican rice, and tortillas. 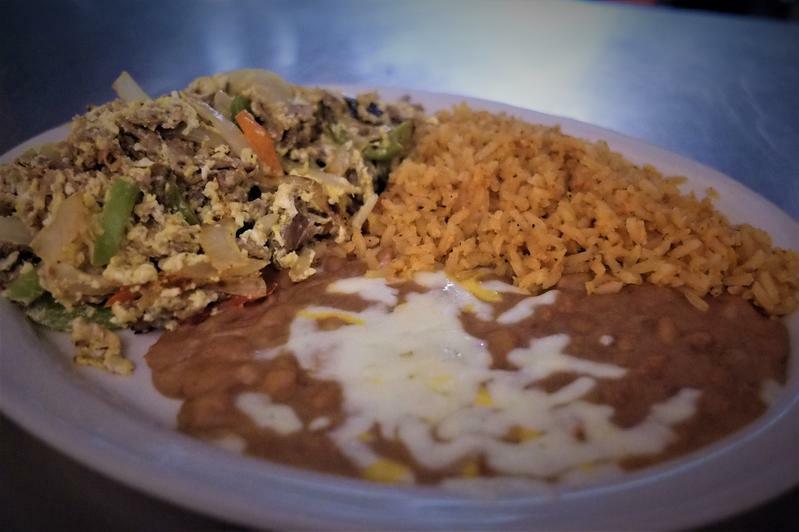 Eggs, shredded beef, onions, and bell peppers, scrambled and served with refried beans and Mexican rice. 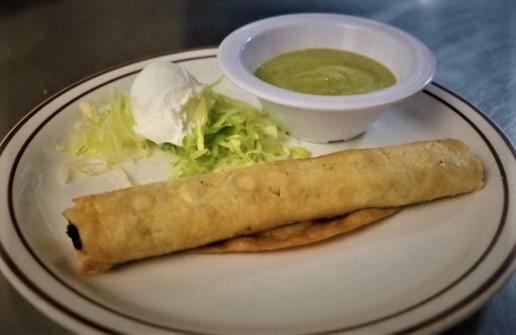 Served with tortillas upon request. 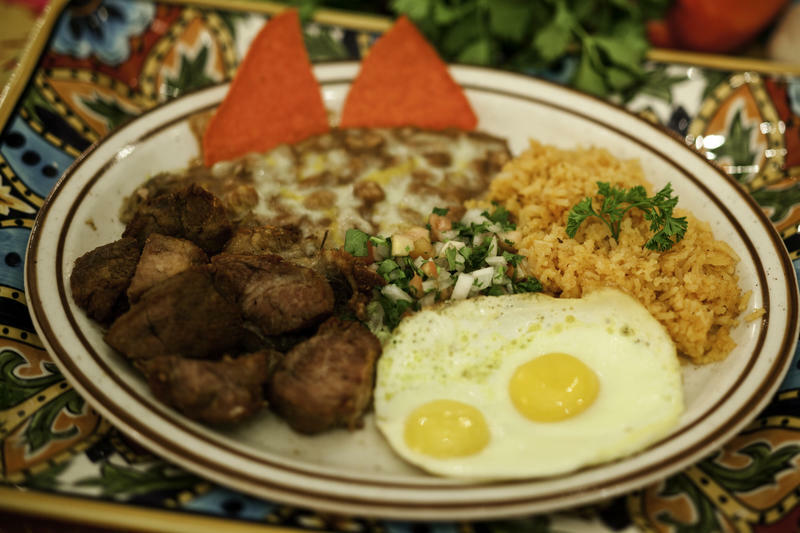 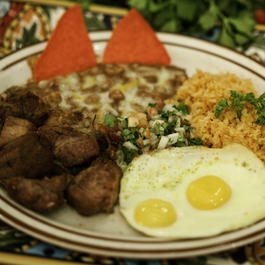 Pork carnitas and two eggs served sunny side up, with refried beans, Mexican rice, and tortillas. 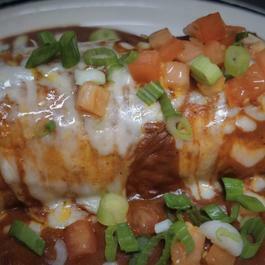 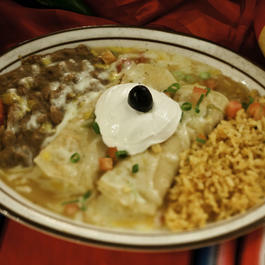 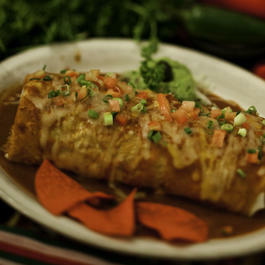 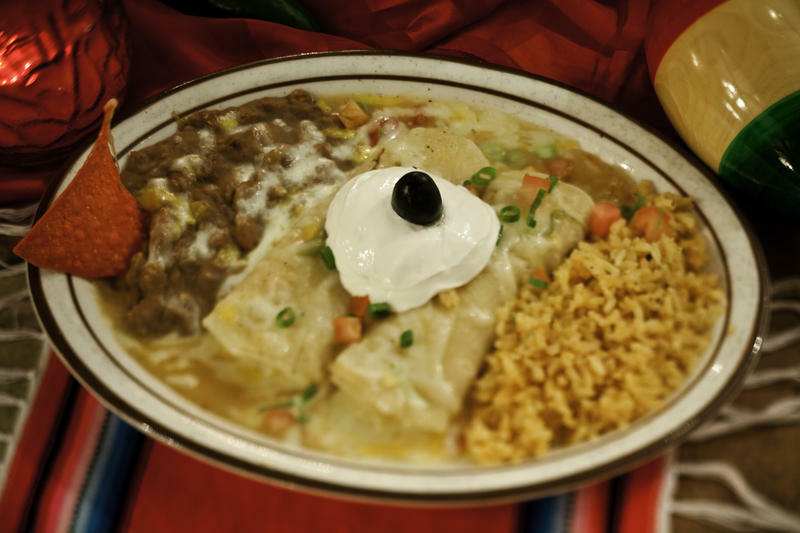 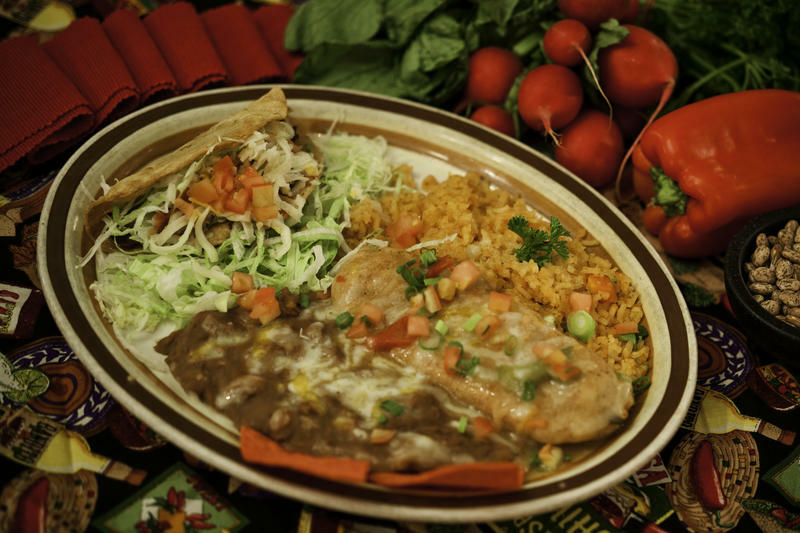 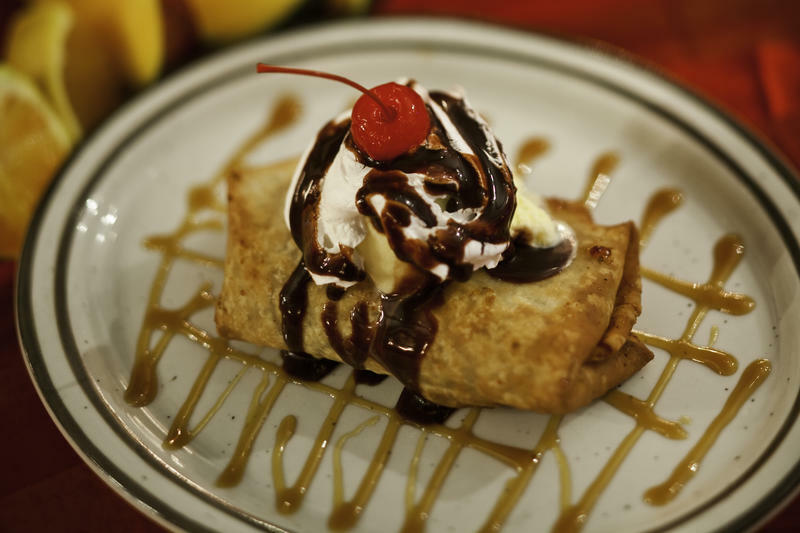 Your choice of one of the following items: cheese enchilada, hard shell taco, chile relleno, or enchilada ranchera. 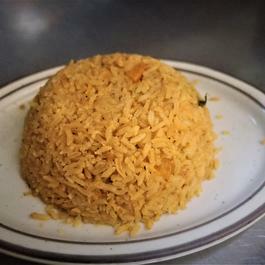 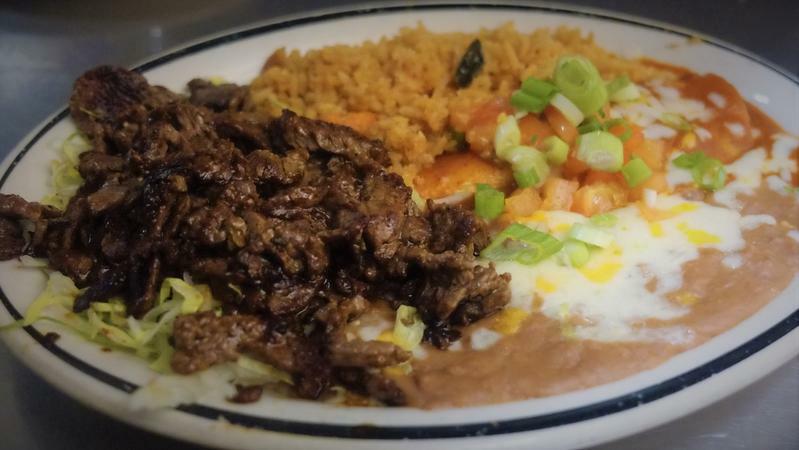 Served with Mexican rice and refried beans. 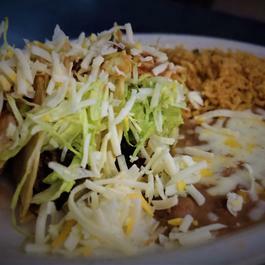 A hard shell chicken or beef taco topped with shredded lettuce, Monterey Jack cheese, and a mild salsa, and a cheese enchilada smothered in our mild red sauce. 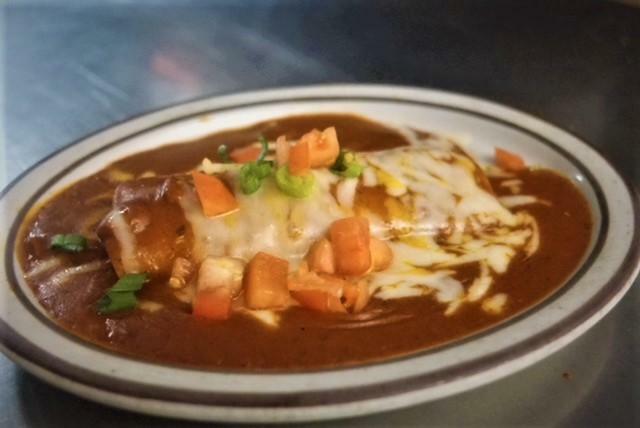 A large flour tortilla, stuffed with your choice of shredded chicken or chile verde (pork), topped with bits of tomato, green onion, melted Monterey Jack cheese, sour cream, and our mild ranchera sauce. 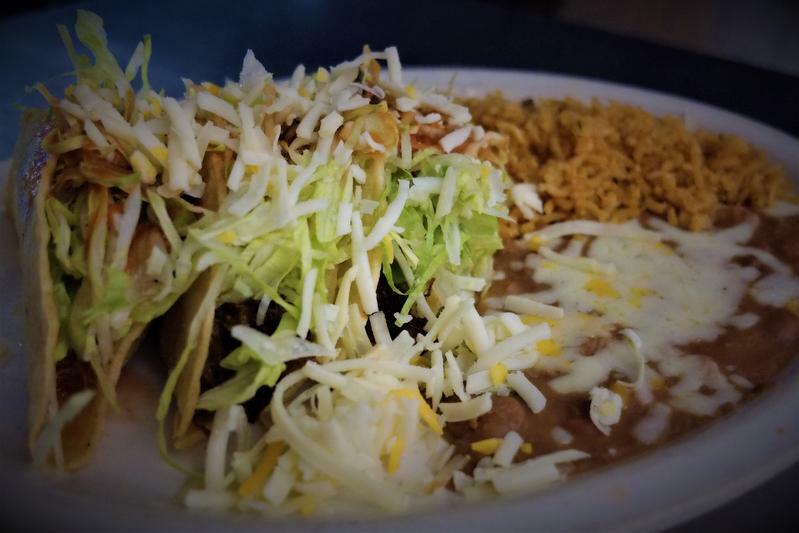 Two tacos filled with your choice of chicken or beef, topped with shredded lettuce, Monterey Jack cheese, and our mild red salsa. 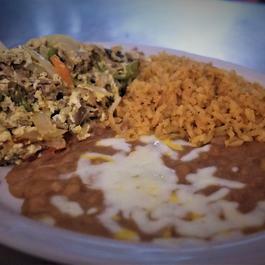 Two crabmeat or shrimp enchiladas, topped with sliced avocado, tomato, and black olives, served with Mexican rice and refried beans. 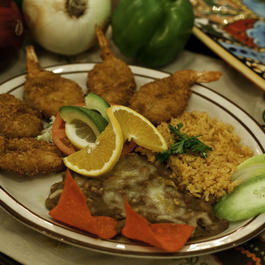 Five breaded jumbo shrimp, served with avocado slices, Mexican rice, and refried beans. 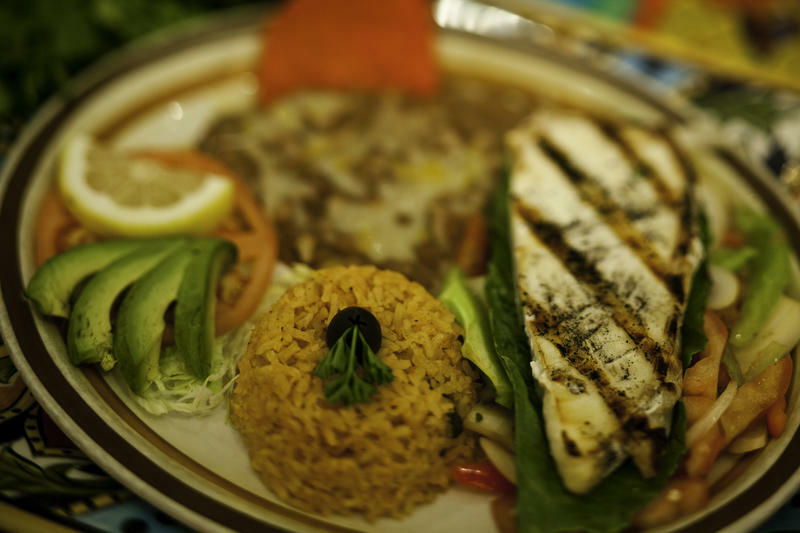 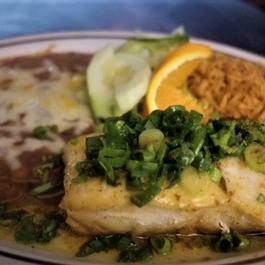 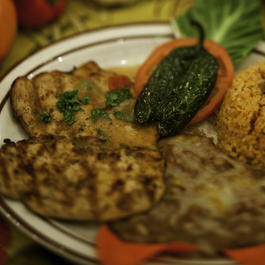 A charbroiled halibut steak, topped with sauteed bell peppers, tomatoes, and onions, served alongside Mexican rice, refried beans, and your choice of corn or flour tortillas. 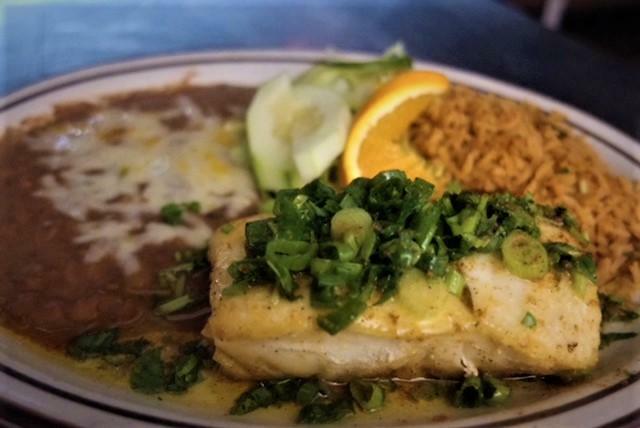 A halibut steak, seasoned with garlic, salt, bits of green onion, and cilantro, all sauteed in butter, and served to you on a steaming platter. 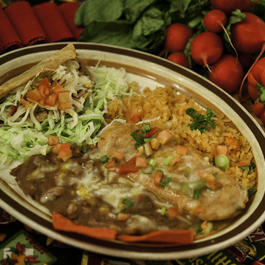 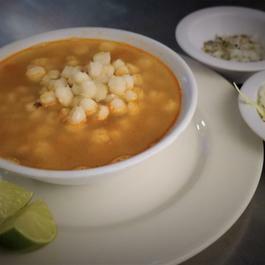 Served with Mexican rice, refried beans, and corn or flour tortillas. 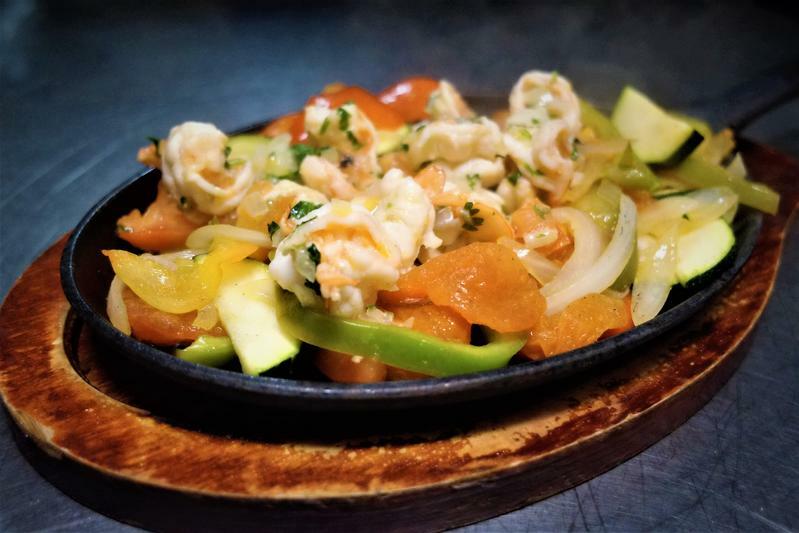 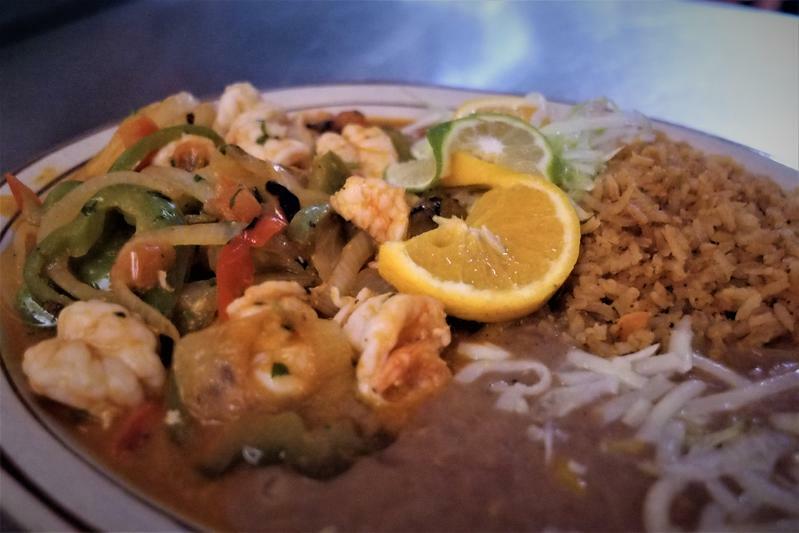 Sauteed shrimp, bell peppers, tomatoes, onions, and cilantro, all topped with our red salsa, and served with rice, beans, and your choice of corn or flour tortillas. 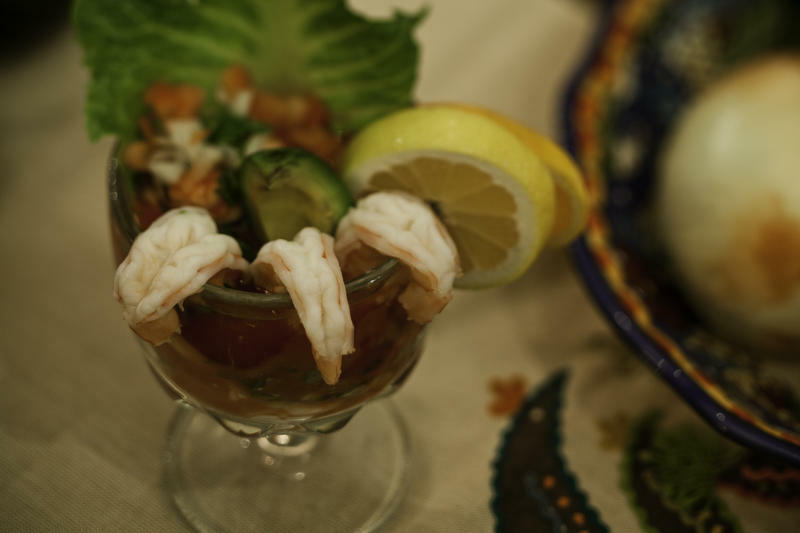 For the true shrimp lover! 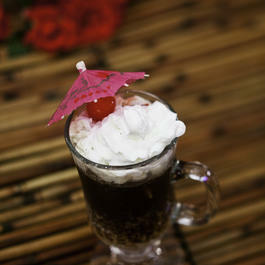 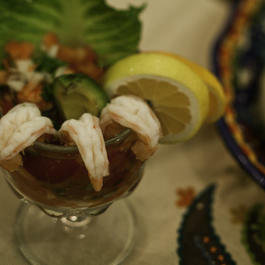 A larger portion of our original coctel de camaron. 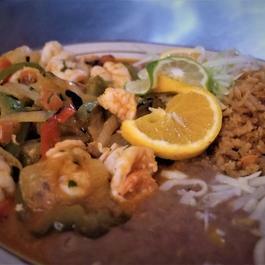 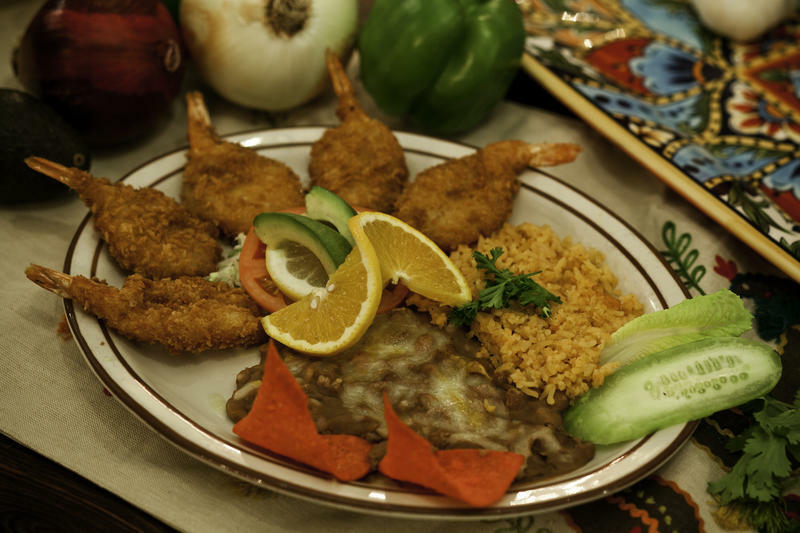 Delicious garlic sauteed jumbo shrimp (5), served with Mexican rice, refried beans, and your choice of flour or corn tortillas. 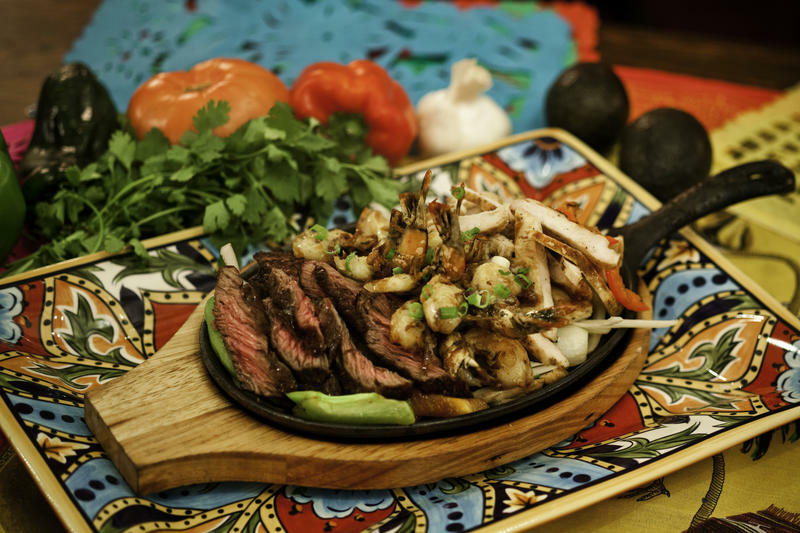 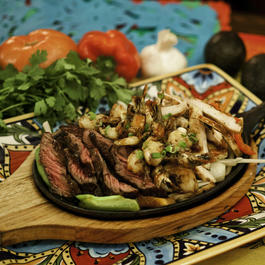 Rib-eye steak, charbroiled to your desire, served with our house guacamole, grilled scallion onions and tortillas. 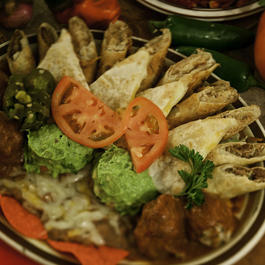 Fried chunks of marinated pork, served with pico de gallo, our house guacamole and warm tortillas. 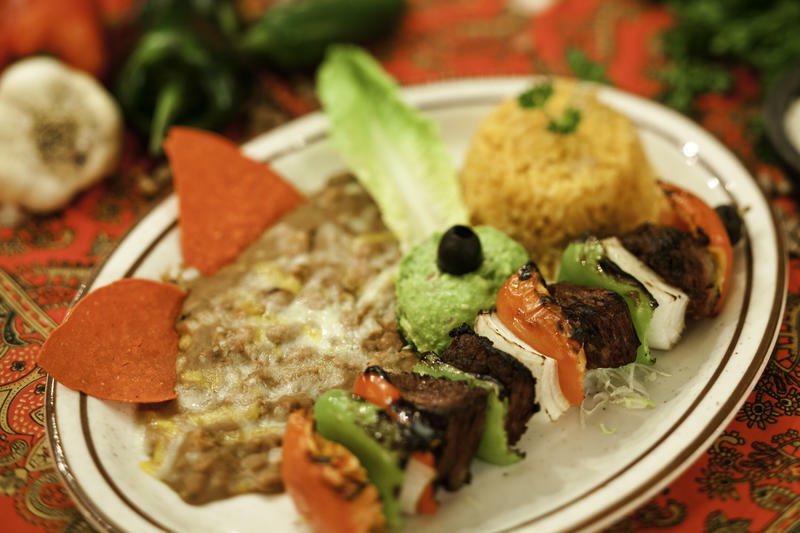 (MEXICAN SHISH-KABOB) Skewered tender pieces of rib-eye steak, bell peppers, onions, and tomato, served alongside a scoop of our house guacamole, and your choice of corn or flour tortillas. 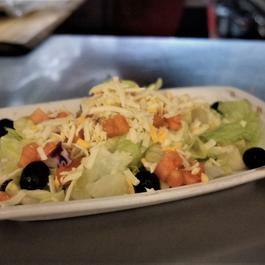 Crispy iceberg lettuce topped with shredded cheese, black olives, tomatoes, and your choice of dressing. 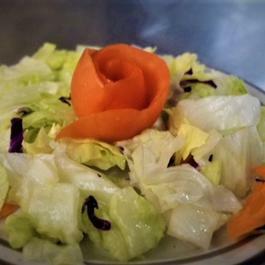 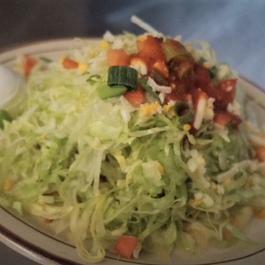 Iceberg lettuce topped with your choice of dressing. 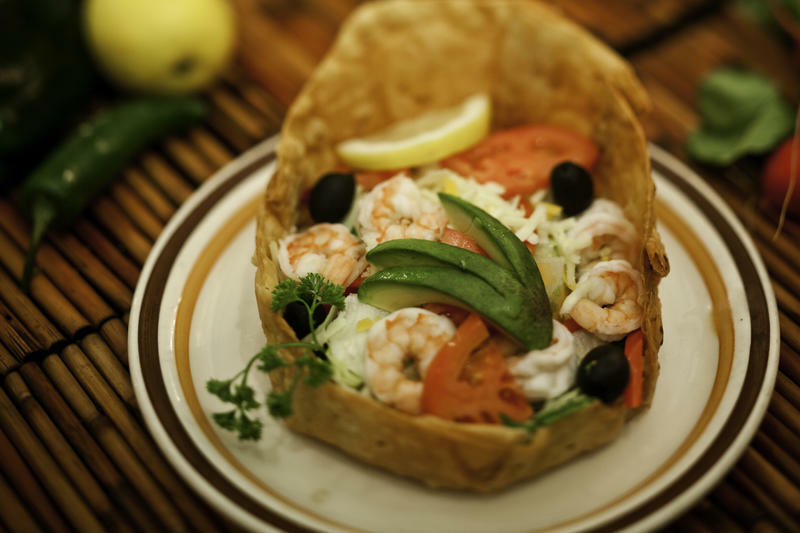 A tossed green salad topped with shrimp, slices of avocado, tomato, black olives, drizzled with your choice of dressing, all nestled in a crispy shell. 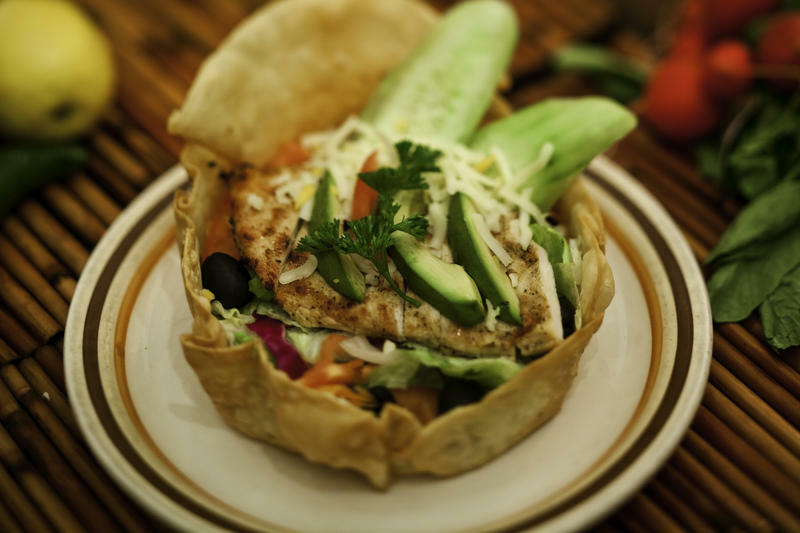 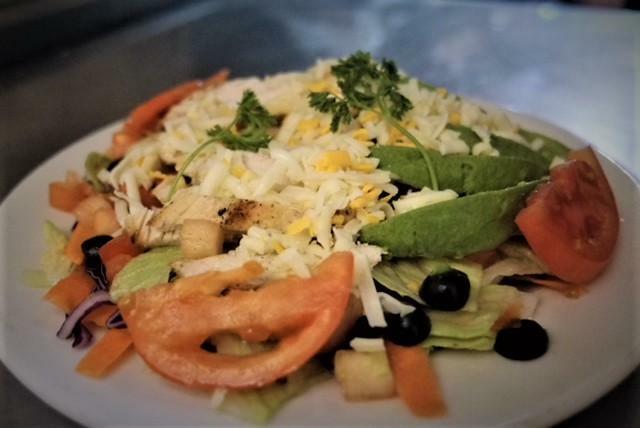 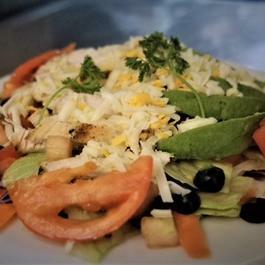 A tossed green salad, topped with your choice of tuna or grilled chicken, avocado, shredded cheese, tomatoes, black olives, Mexican rice, refried beans, and served in a crispy tortilla shell. 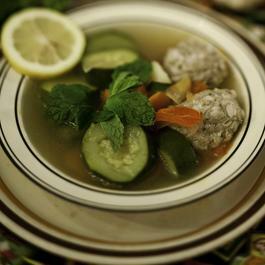 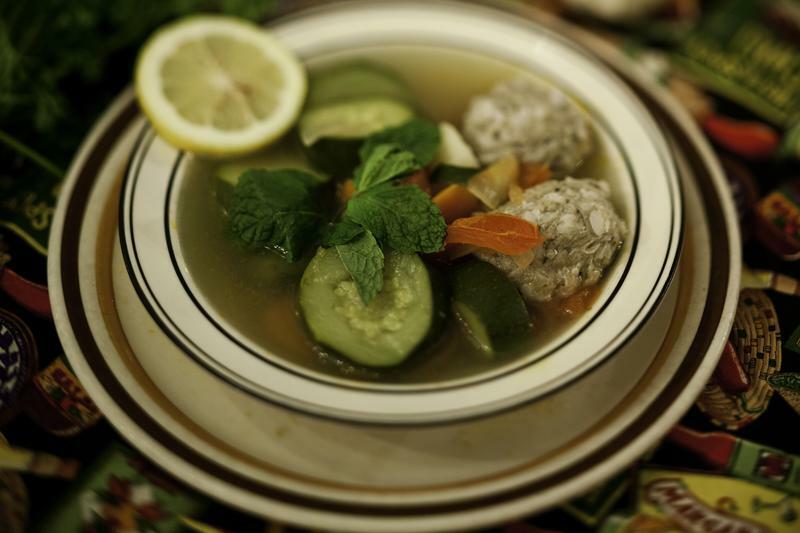 (Beef or Chicken Meatballs) Our specially seasoned meatballs, served in a hot broth, with cabbage, celery, carrots, green beans, corn, tomatoes, onions, and served with a side of rice. 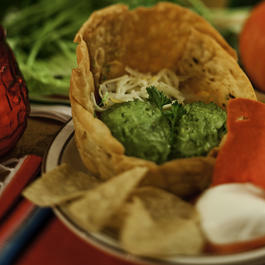 A Mexican tradition! 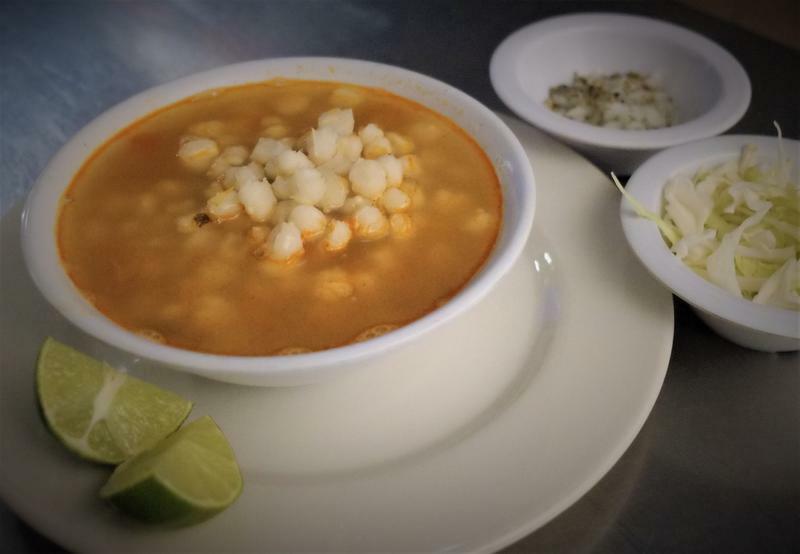 Chicken, hominy, cabbage, onion, oregano and crushed chili flakes, served in a delicious broth. 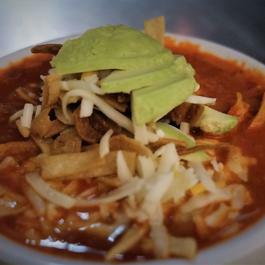 Shredded chicken in our delicious chile guajillo and tomato based broth, topped with tortilla strips, Monterey Jack cheese, and avocado chunks. 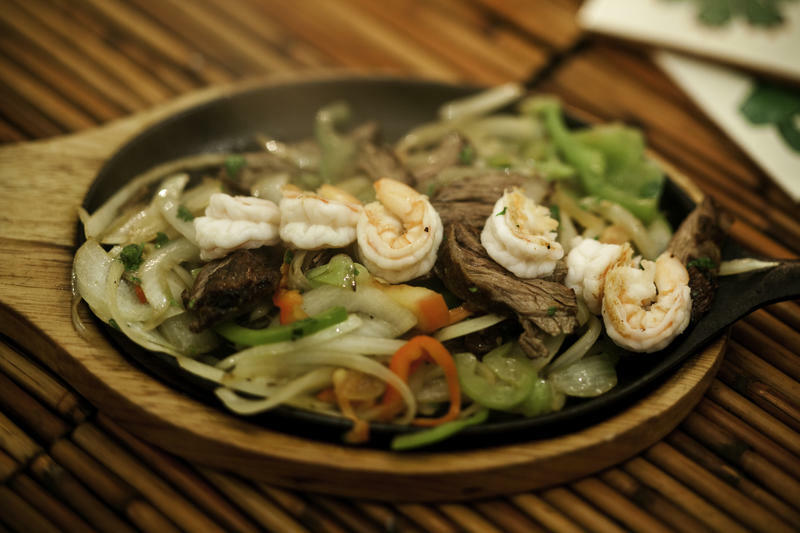 (serving for 2 persons) Sauteed shrimp, strips of chicken, and rib-eye steak, topped with red onions and oregano, and served on a sizzling skillet. 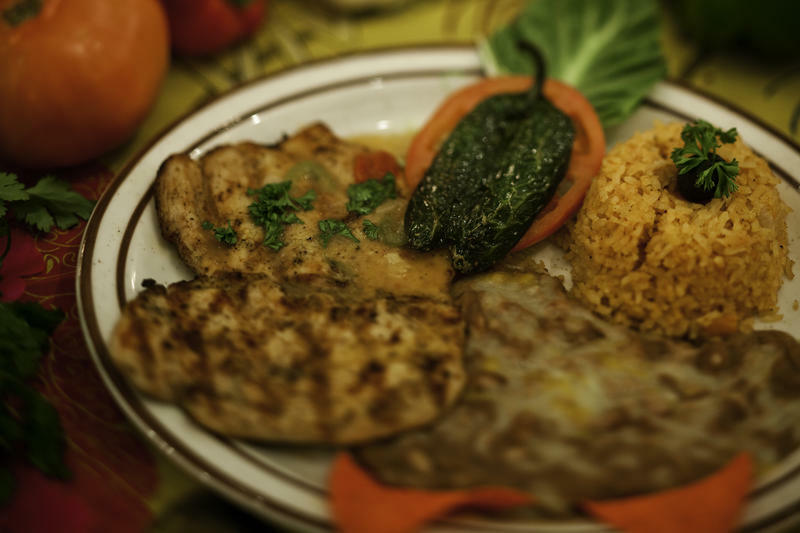 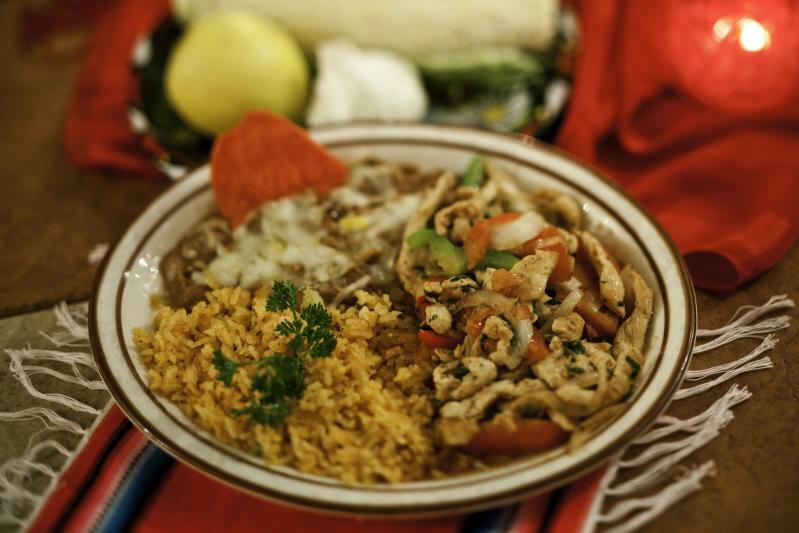 A grilled chicken breast filet, topped with salsa ranchera and served with your choice of flour or corn tortillas. 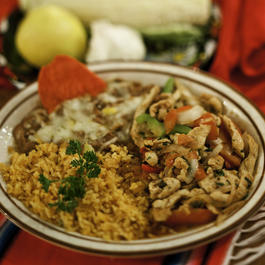 Shredded chicken or beef, mixed with bits of tomato, onion, and bell pepper, rolled into flour tortillas and fried. 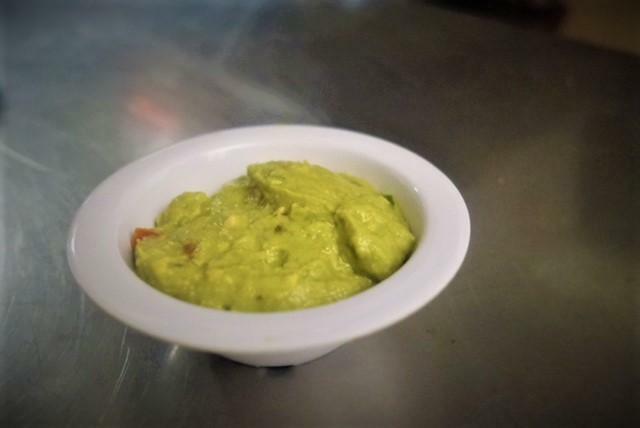 Topped with sour cream and guacamole. 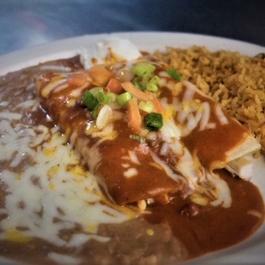 Two cheese enchiladas, smothered with our salsa ranchera, and topped with sour cream and guacamole. 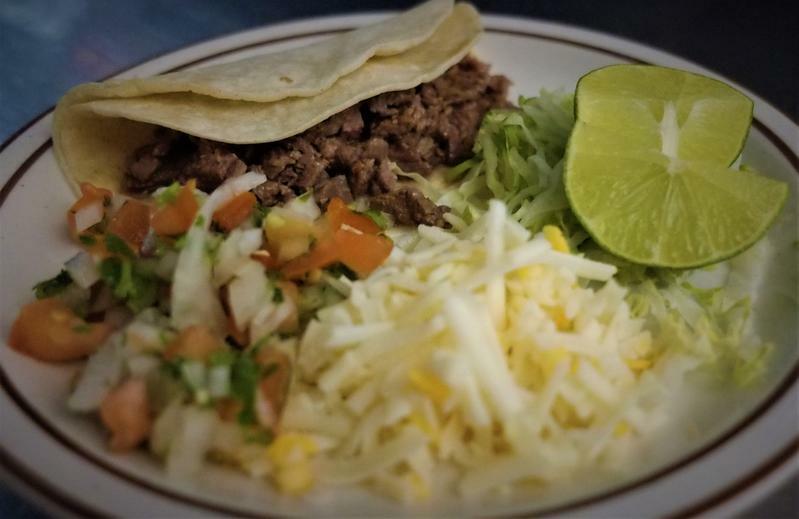 Two specially seasoned hard shell potato, cheese, and onion tacos, topped with shredded lettuce, Monterey Jack cheese, and our mild red salsa. 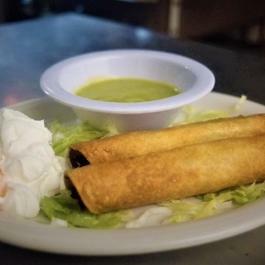 Wrapped in soft corn tortillas, and topped with shredded lettuce, Monterey Jack cheese, pico de gallo, and guacamole. 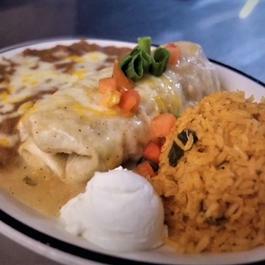 Grilled chicken enchiladas (topped with a ranchera sauce), or carne asada enchiladas (topped with our red sauce), served alongside pinto beans and Mexican rice, and a scoop of sour cream. 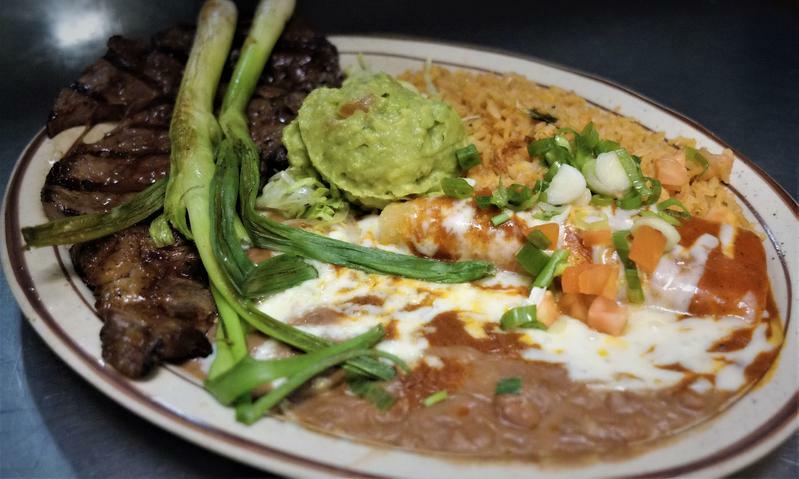 Rib-eye steak and a cheese enchilada smothered in our red sauce, served with a side of guacamole and your choice of corn or flour tortillas. 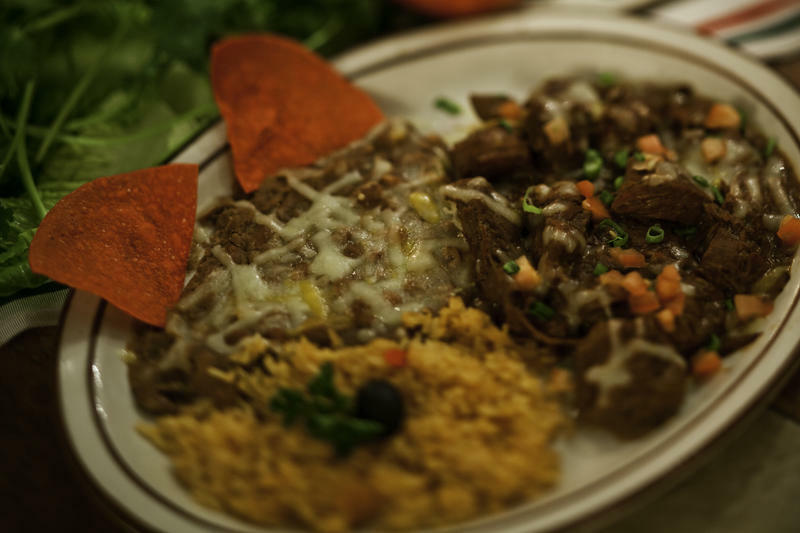 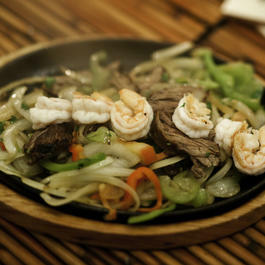 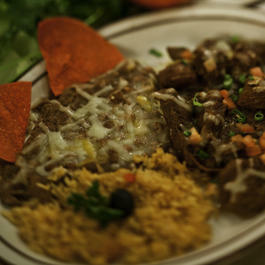 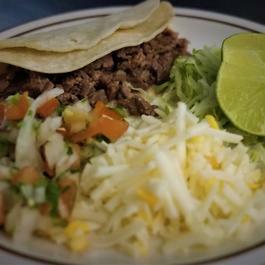 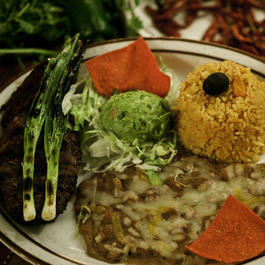 Strips of specially marinated flap meat steak, served with a cheese enchilada and your choice of corn or flour tortillas. 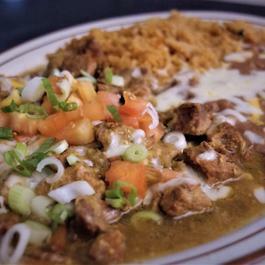 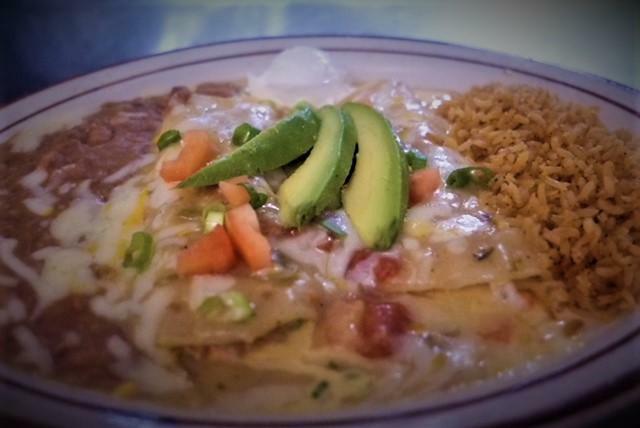 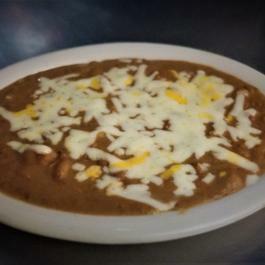 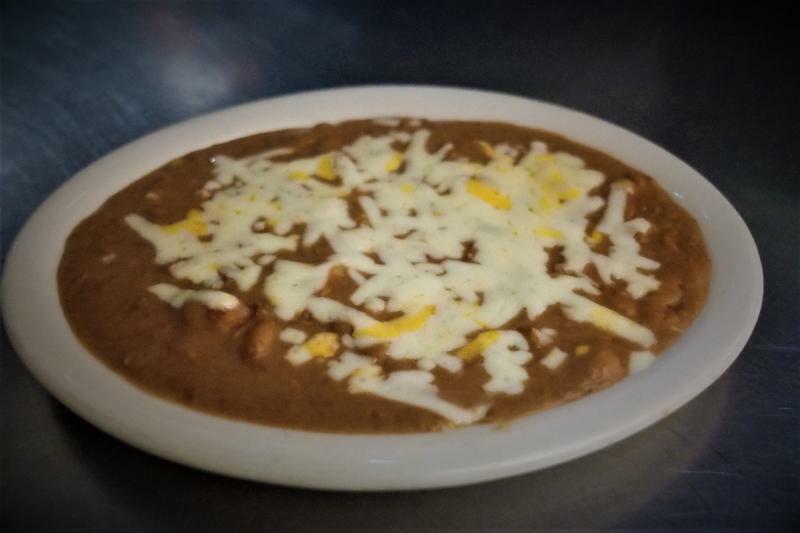 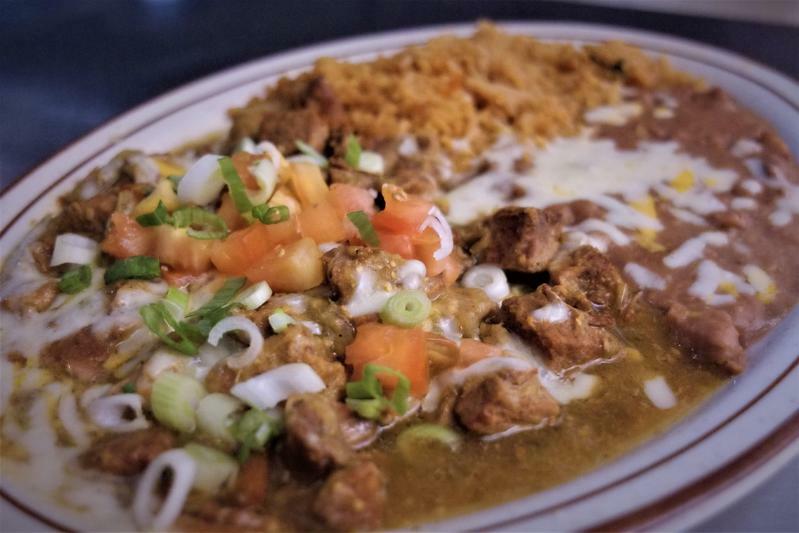 Chunks of beef or pork, simmered in our homemade red or green chile sauce, and served with corn or flour tortillas. 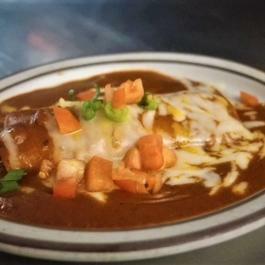 A giant sized flour tortilla, filled with your choice of chile con carne (pork or beef) or shredded chicken, and layered with refried beans, Mexican rice, shredded lettuce, tomato, green onion, and topped with our red sauce (beef) or ranchera sauce (pork or chicken), chopped tomato, green onion, and melted cheese. 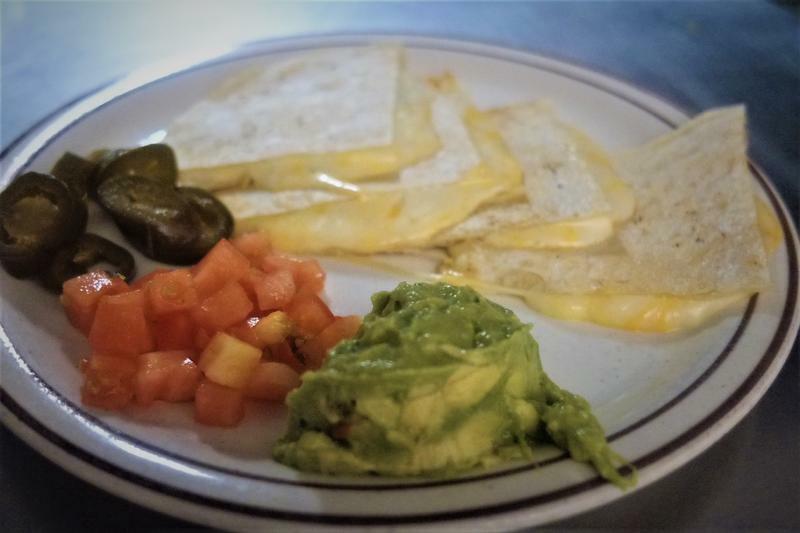 Comes with a side of guacamole and sour cream. 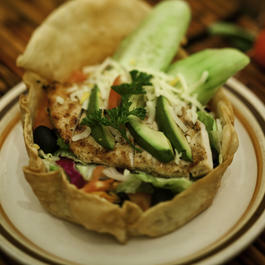 Breaded or grilled fish tacos, layered with lettuce, cheese, and pico de gallo. 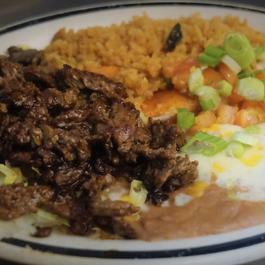 Served with Mexican rice and refried beans. 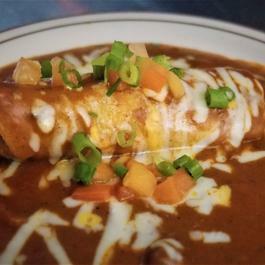 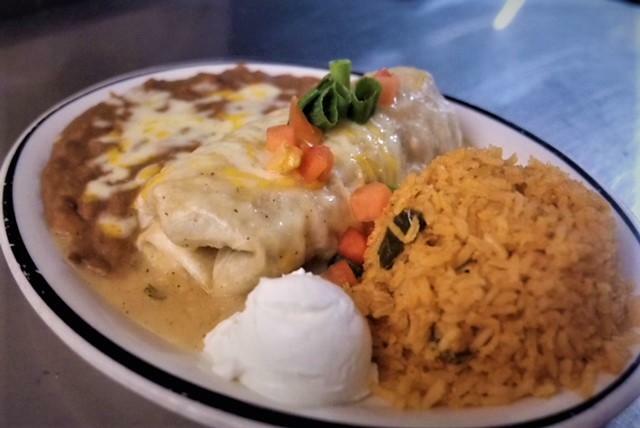 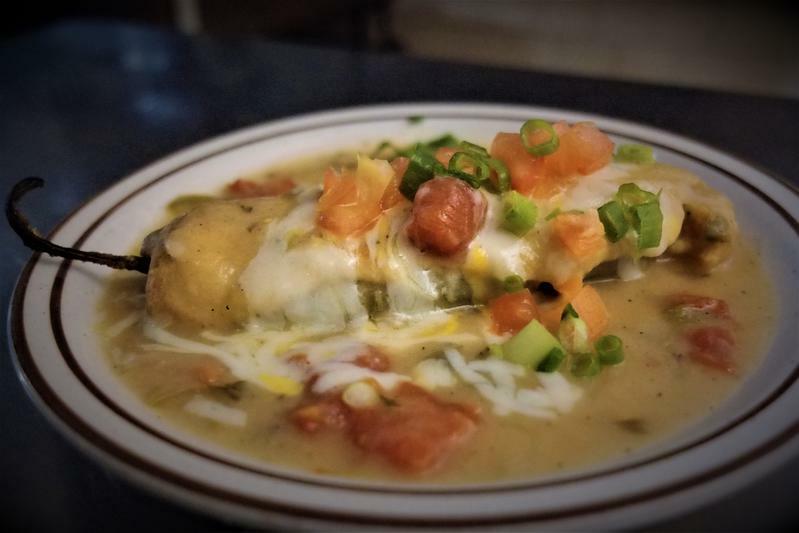 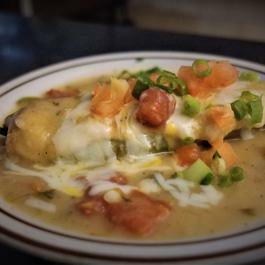 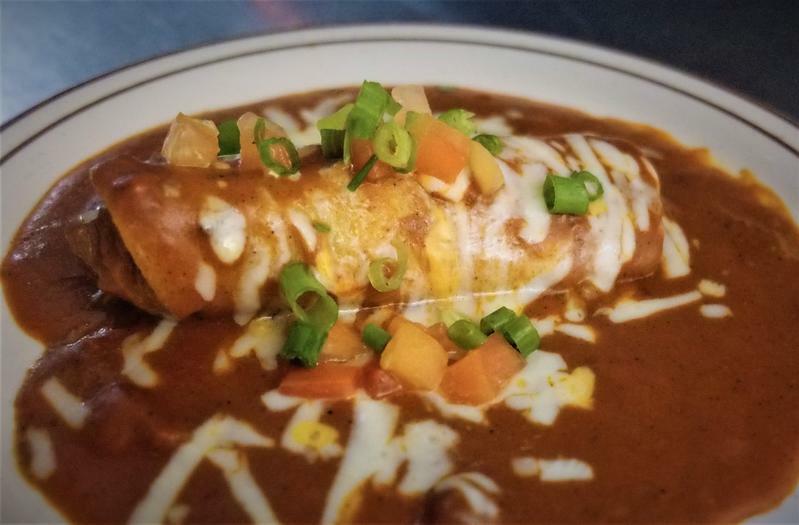 Beef or chicken, wrapped in a corn tortilla, smothered in our red enchilada sauce (beef) or ranchera sauce (chicken), topped with melted cheese, chopped green onion, and tomato. 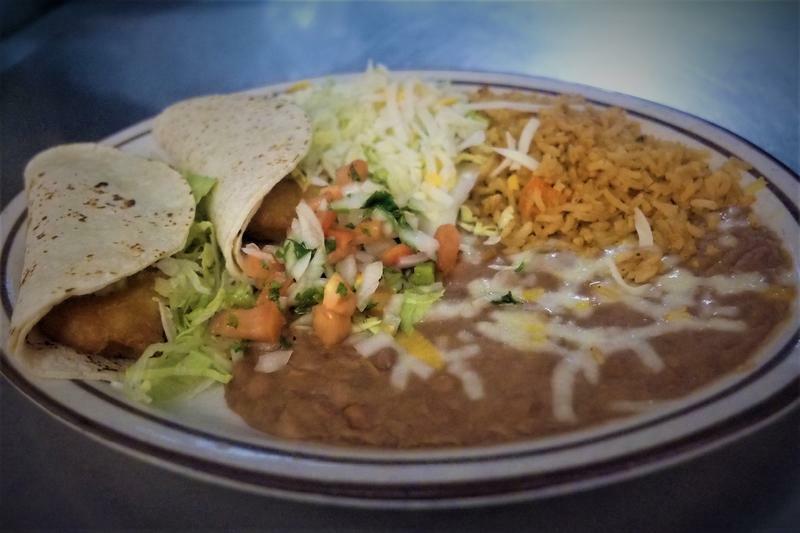 Your choice of filling, stuffed in a crispy fried tortilla, and topped with shredded lettuce, Monterey Jack cheese, chopped tomato and our house salsa. 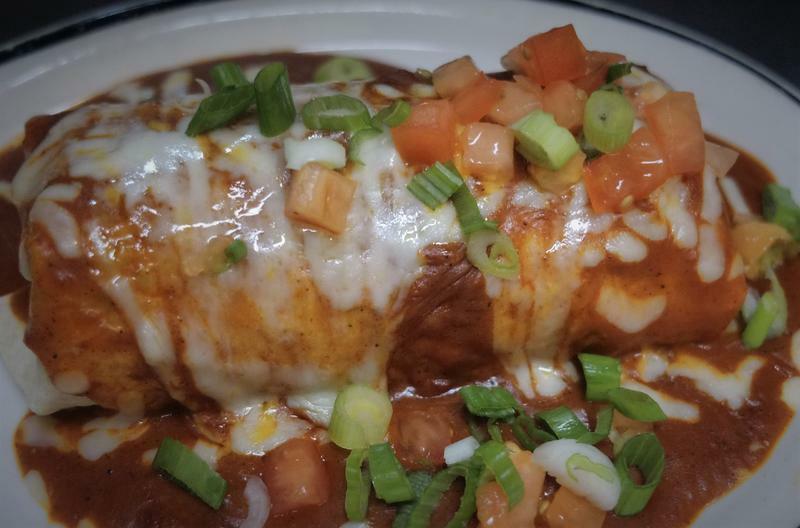 A corn tortilla stuffed with Monterey Jack cheese, heated to perfection and smothered in our red enchilada sauce, topped with cheese, chopped green onion and tomato. 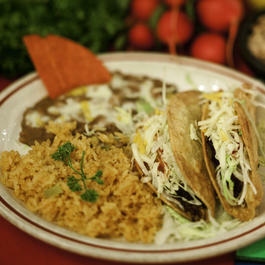 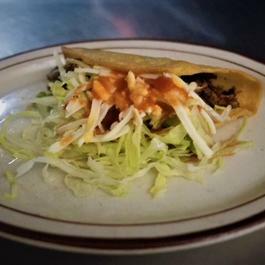 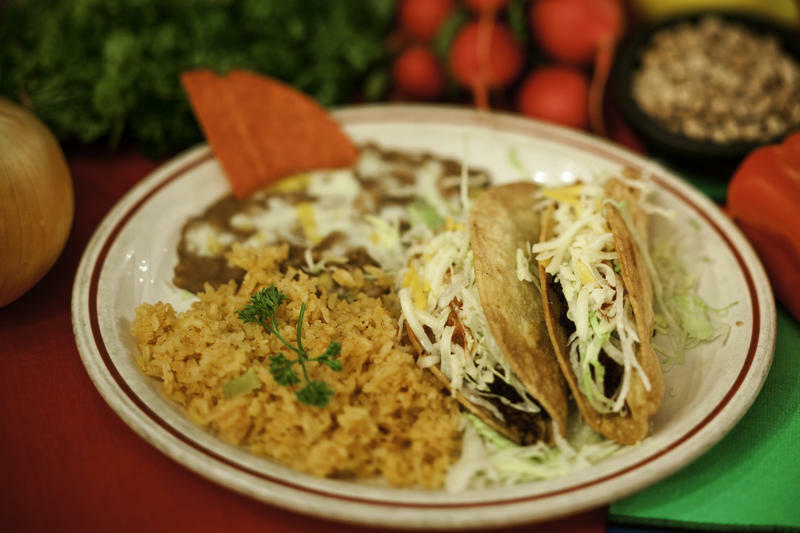 Two corn tortillas stuffed with your choice of shredded beef or chicken, and deep fried to crispy perfection. 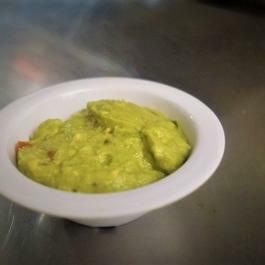 Served with a side of guacamole sauce. 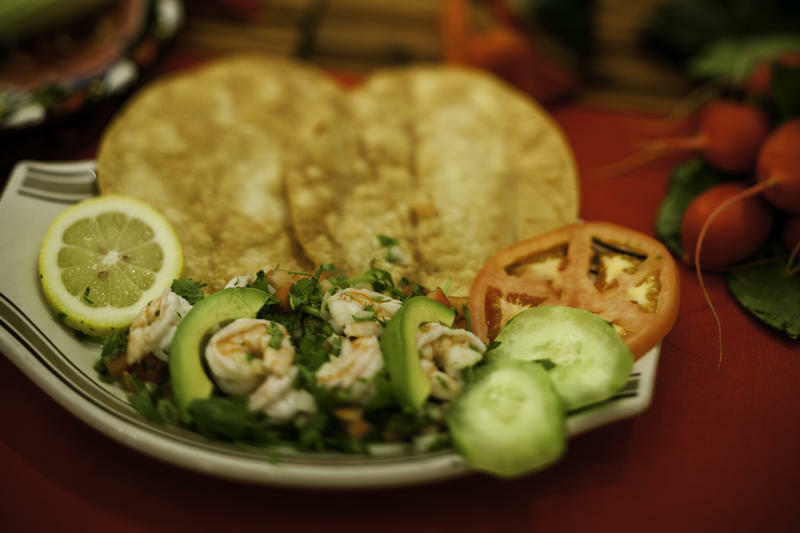 A crispy, flat tortilla shell, topped with a mix of shrimp, white fish, krab meat, onions, tomato, cilantro, a splash of lime juice, and garnished with a side of lettuce and sliced avocado. 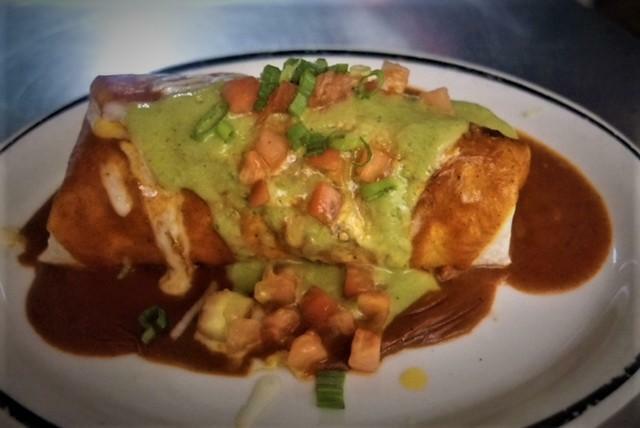 An Anaheim pepper, stuffed with Monterey Jack cheese, egg battered, and topped with our salsa ranchera, diced tomato and green onion. 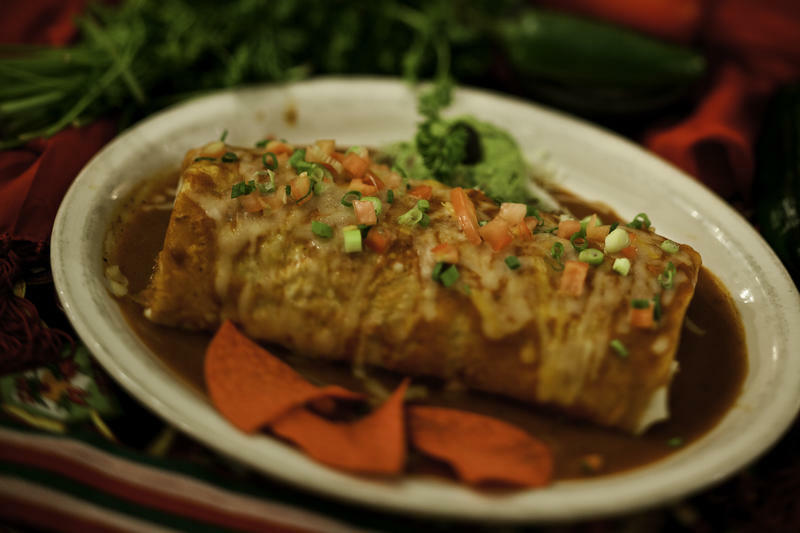 A large flour tortilla, stuffed with your choice of meat, cheese and beans. 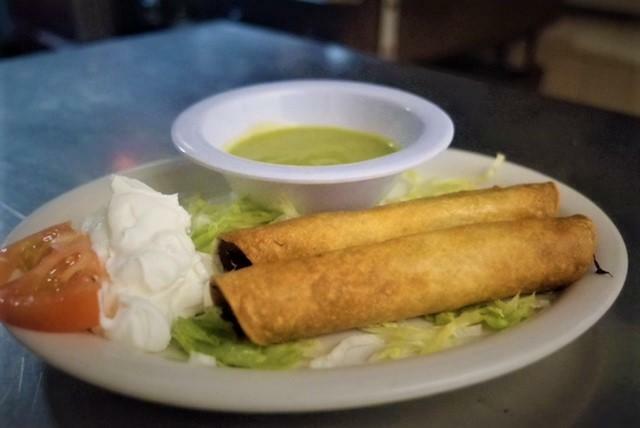 Your choice of meat, wrapped in two corn tortillas, and topped with shredded lettuce, Monterey Jack cheese, and pico de gallo. 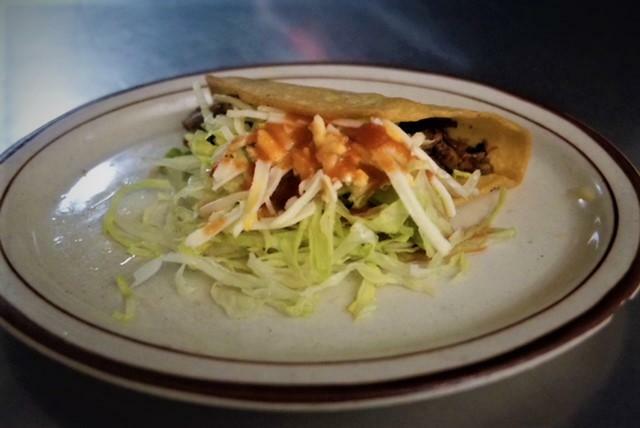 A giant tostada, topped with beef or chicken, refried beans, lettuce, Monterey Jack cheese, our mild red sauce, and tomato. 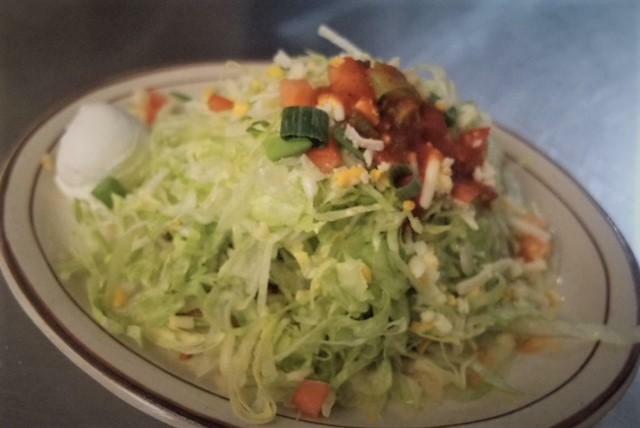 A giant tostada, topped with guacamole, shredded lettuce, tomato, and Monterey Jack cheese. 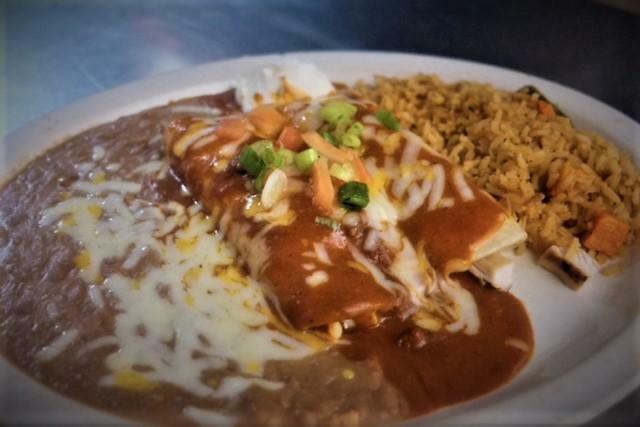 A large flour tortilla, filled with your choice of meat, Monterey Jack cheese, smothered with our red sauce (beef) or ranchera sauce (chicken, pork), and topped with melted cheese, diced tomato and green onion. 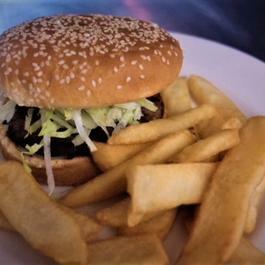 An American favorite! 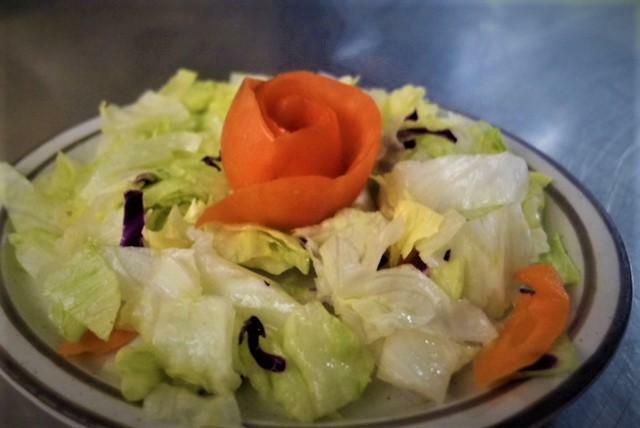 Comes with lettuce, tomato, and thousand island dressing. 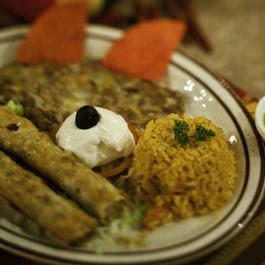 Shredded chicken or beef, mixed with bits of tomato, onion, and bell pepper, rolled into a flour tortilla and fried. 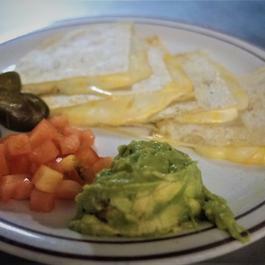 Served with guacamole sauce and sour cream. 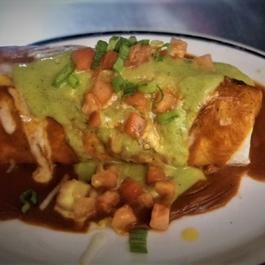 A large flour tortilla, filled with strips of carne asada, lettuce, tomato, and Monterey Jack cheese, topped with diced tomato, green onion, melted cheese, and our red and guacamole sauces. 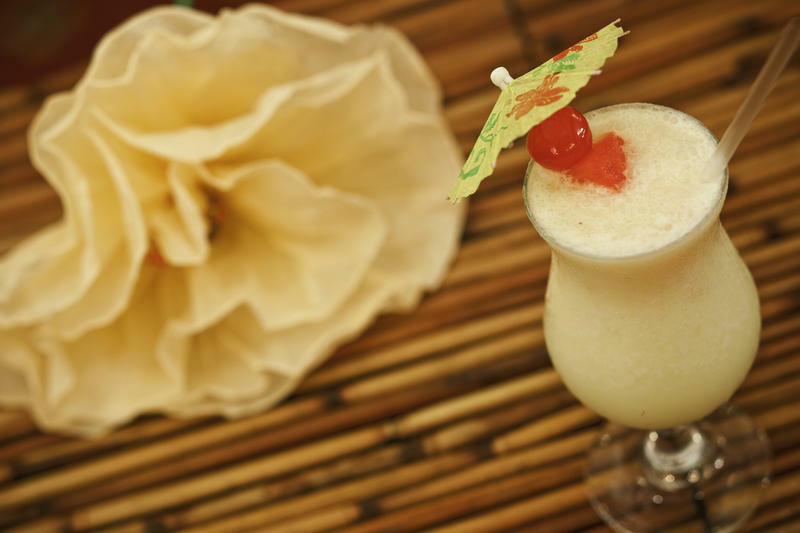 Peach, Mango, Strawberry, Pineapple, Melon or Banana. 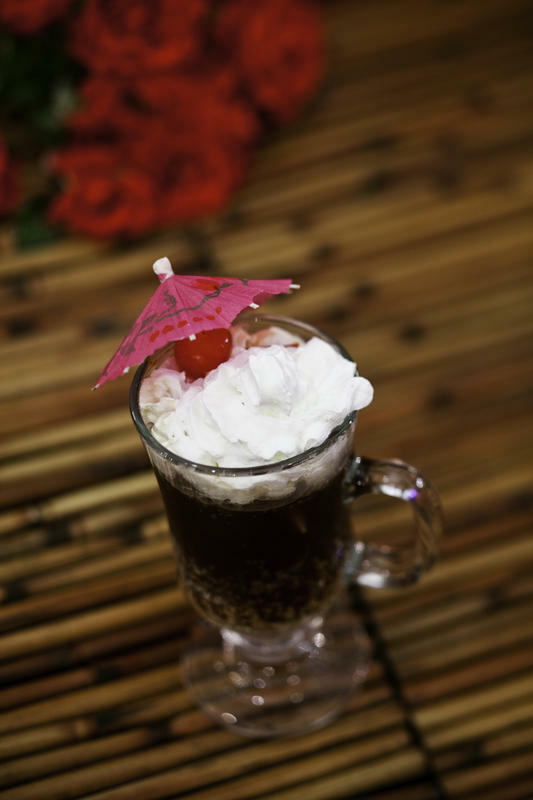 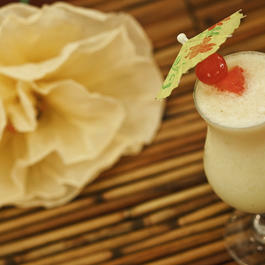 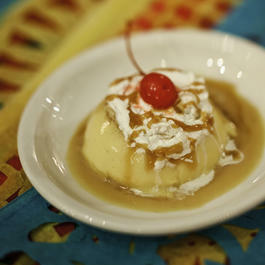 Our house-made pina colada, in single or double sizes! 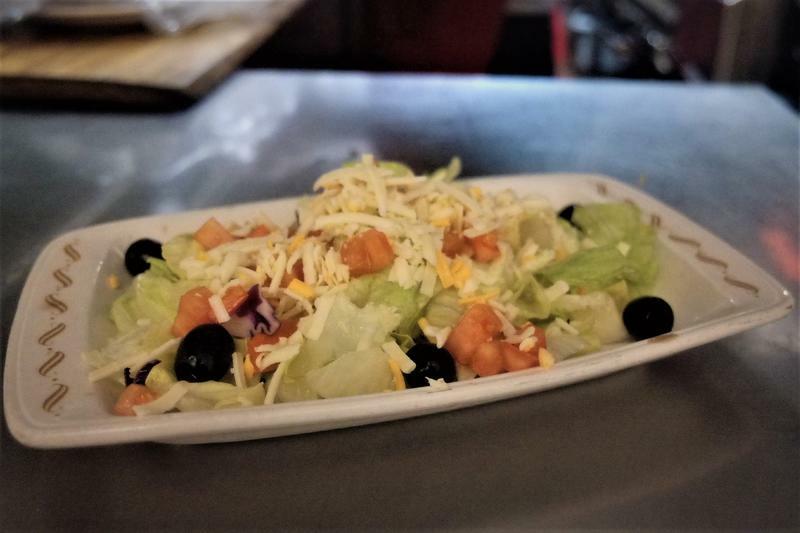 Come by and try it out for yourself! 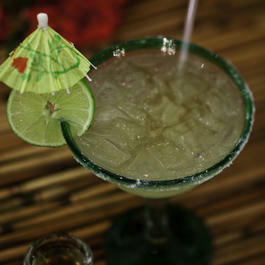 Made with agave nectar and fresh lime juice. 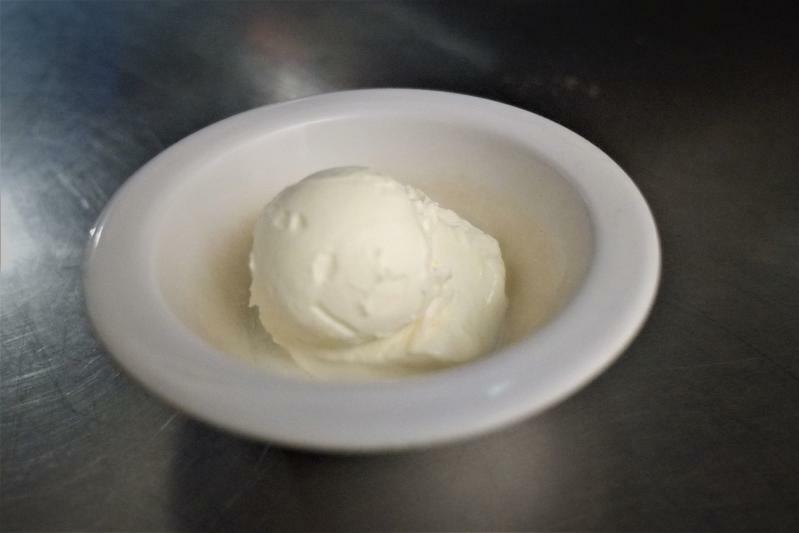 Deliciously home-made and not from a packet. 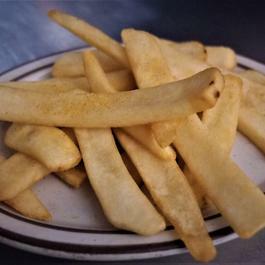 We cook our dishes in vegetable oil. 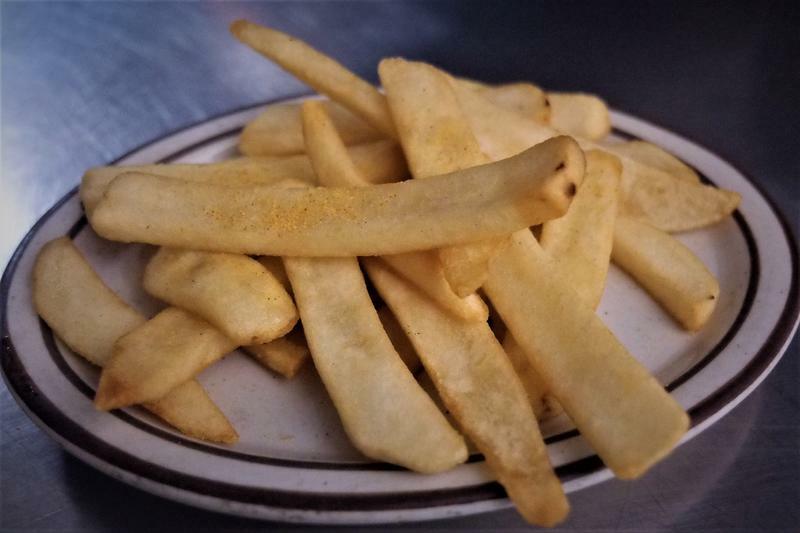 Please alert us about any food allergy you may have.